Hey folks. I hope you’re having a great day today. One of my favorite sayings is “the best lessons learned are the lessons earned.” And what that means is that by getting out there and actually trying something, and possibly failing, that’s when you will learn the most. It doesn’t always have to be failure. You can learn a lot by simply trying something new. That’s the theme with this project. Lots of lessons learned by trying something new but also a lot of lessons learned by failure. With this project I’ll go through the thought process at each stage and talk about the lesson learned. 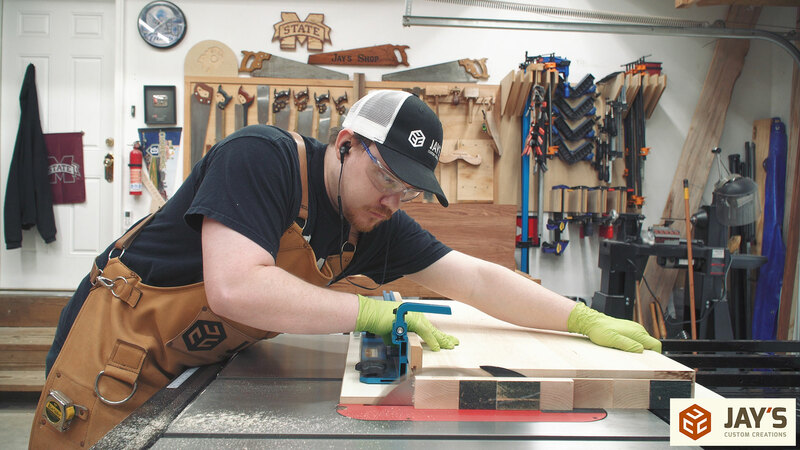 The goal for this project was to create some nice end grain inlay cutting boards and I’m starting by crosscutting the rough sawn maple and bubinga at my miter saw station. 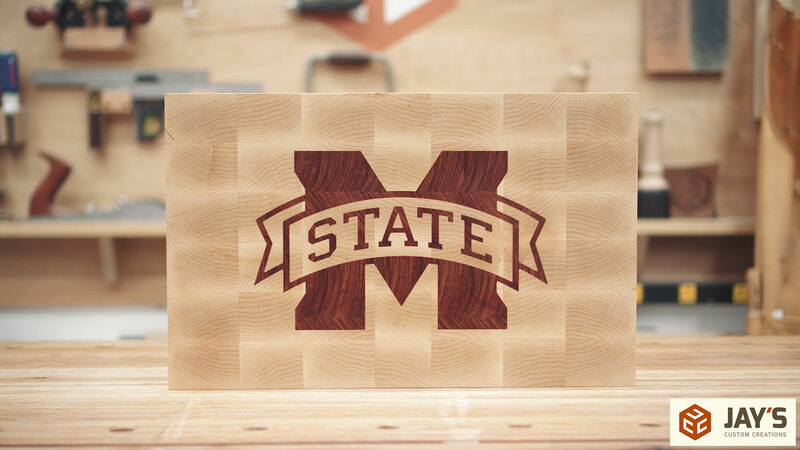 The inlay design is going to be the Mississippi State University logo and these two species are a good choice for the maroon and white university colors. 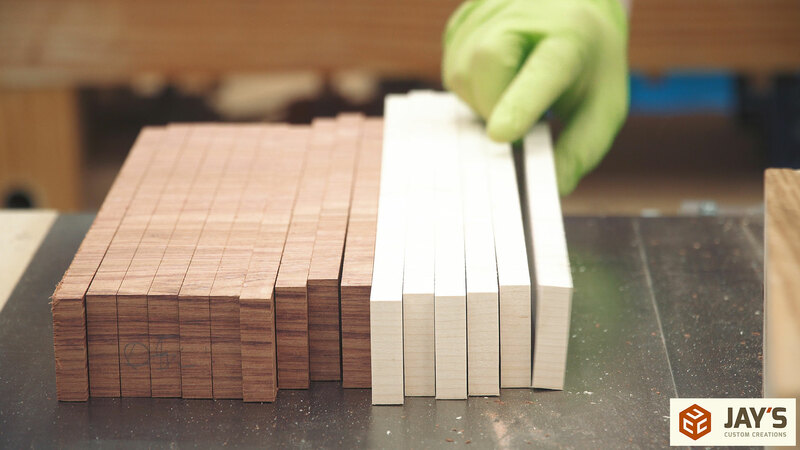 After crosscutting, each board is jointed on one wide face and one narrow face. And then planed just enough to remove the rough sawn surface. To help randomize the end grain pattern I made a few rip cuts at the table saw to give me more pieces to glue back together. I know someone’s going to ask about the green gloves. These are nitrile gloves I picked up on Amazon and I use them for better traction when my hands are dry. They’re tight enough that I still get the tactile feedback of working with bare hands but also have a bunch of small bumps on the gloves that help with grip. Before gluing the boards back together I twisted them around to get an alternating grain direction on the end grain faces. Kinda like a smiley face, frown face, smiley face, frown face. Here’s lesson learned number one; don’t use a lot of glue for the first glue up. 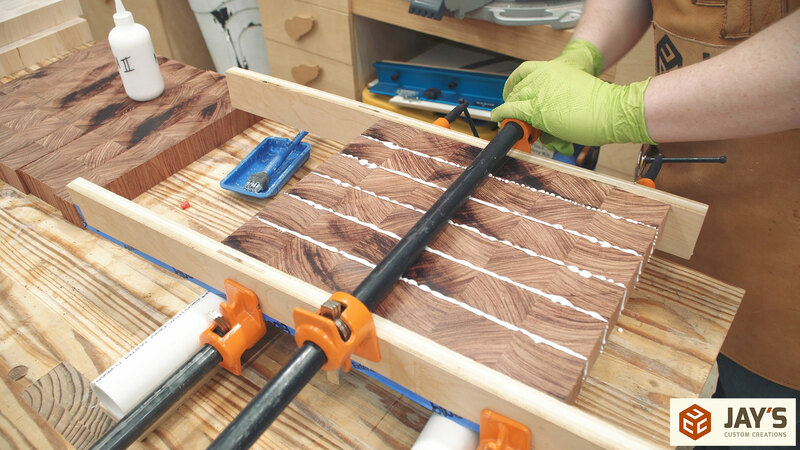 I don’t know why but I ALWAYS use waaaaaay too much glue on the first glue up. So wasteful. It’s a lot easier and cleaner to add glue in places where it’s needed than try to fumble around with all the extra glue. Naturally, I used a lot less glue on the maple board. After letting the panels dry overnight I started the next day by planing them flat. 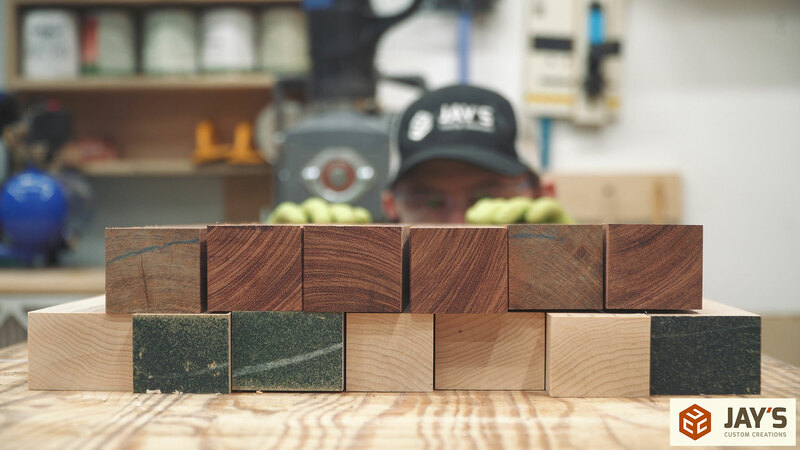 The bubinga board was just shy of 16” wide, which is the maximum capacity of my planer, so just a couple passes through the planer is all it took. The maple board was just a little bit wider than the capacity of my planer so I used the drum sander to clean the glue-up. Lesson learned number two: use the correct tool for the job. 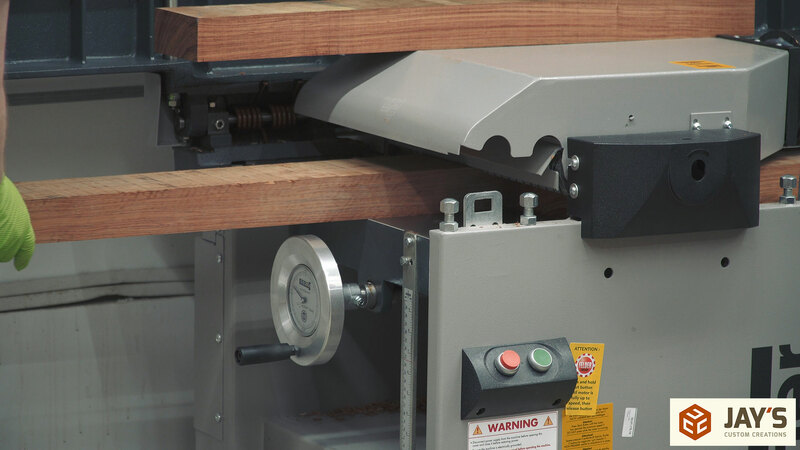 Generally speaking, a drum sander should be used with the intention of sanding the surface and not with the intention of thicknessing a board. 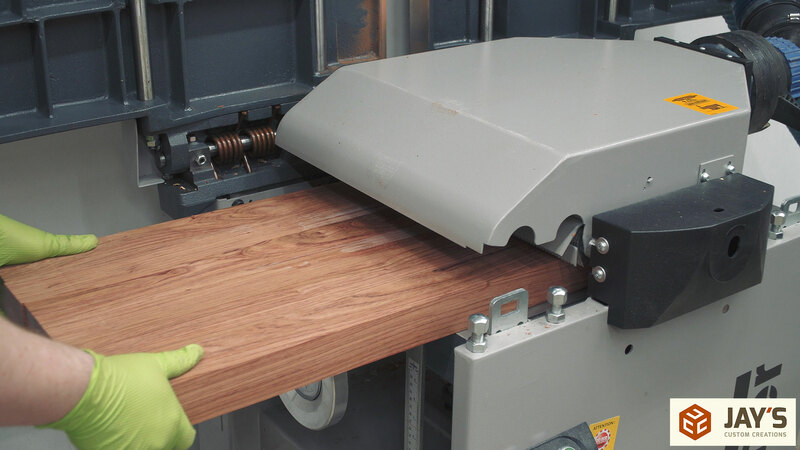 The drum sander worked in this situation but it was incredibly slow which caused me to get too aggressive with the material removal and therefore ruin the sandpaper prematurely. 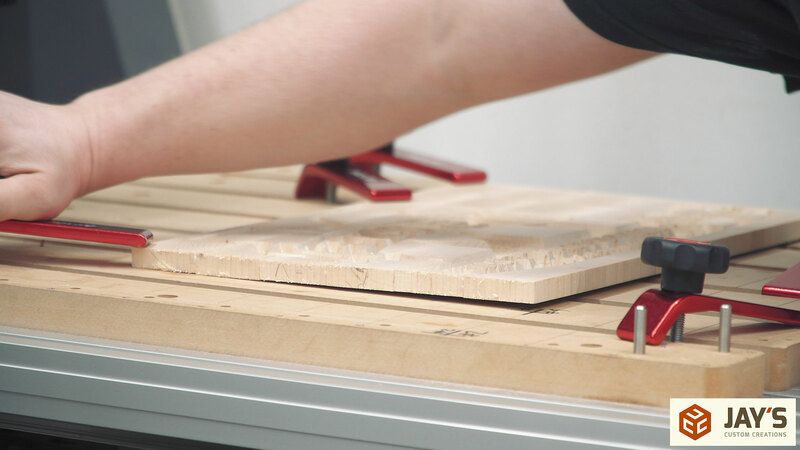 My CNC machine has a 24” cutting width so it would have been a more efficient use of time and resources to use it with a wide spoilboard surfacing bit to flatten the panel. 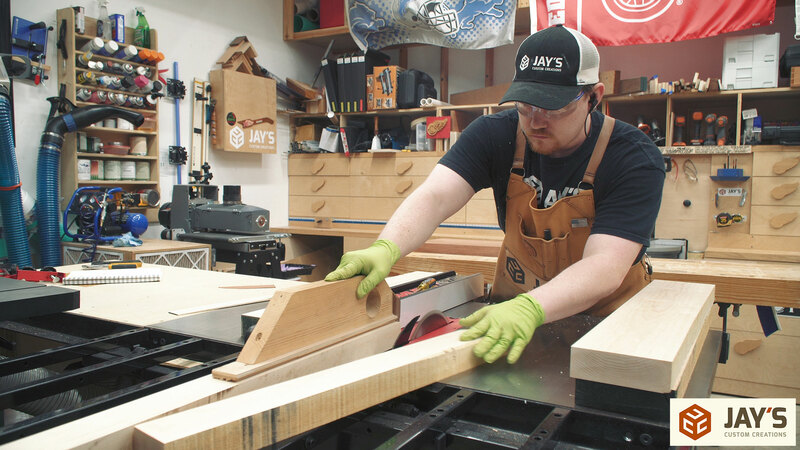 Next, each panel is crosscut with a table saw sled to establish a square end. And with the freshly squared end against the fence all of the smaller strips can be cut. Notice that I’m not leaning over the blade to remove the cut piece. 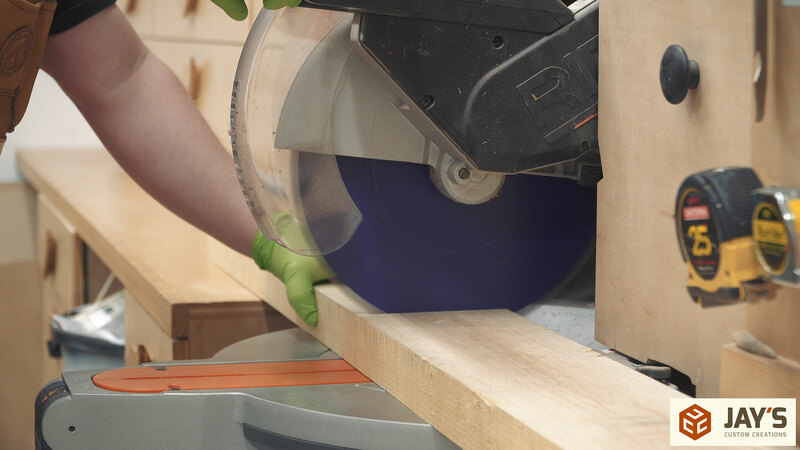 I know that sometimes it’s unavoidable but whenever possible don’t lean over the saw blade, for obvious reasons. It only takes a small amount of effort to stand to the side before reaching for the material. I saved a few inches of each panel to cut into smaller strips for the inlay material. These pieces were cut to about 1/2” wide if I recall correctly. With everything cut I laid out all of the pieces to see exactly how much material I had. 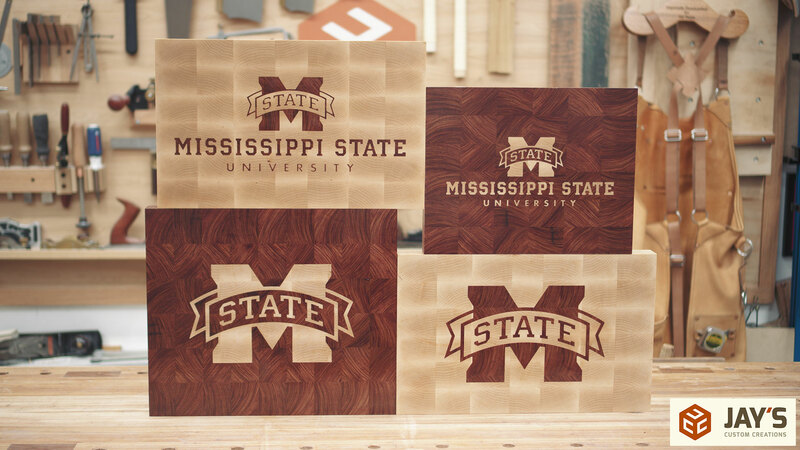 My original plan was to make two end grain boards; one large maple board and one large bubinga board. But that changed here as I thought the bubinga board was just too long so I broke it up into two boards. 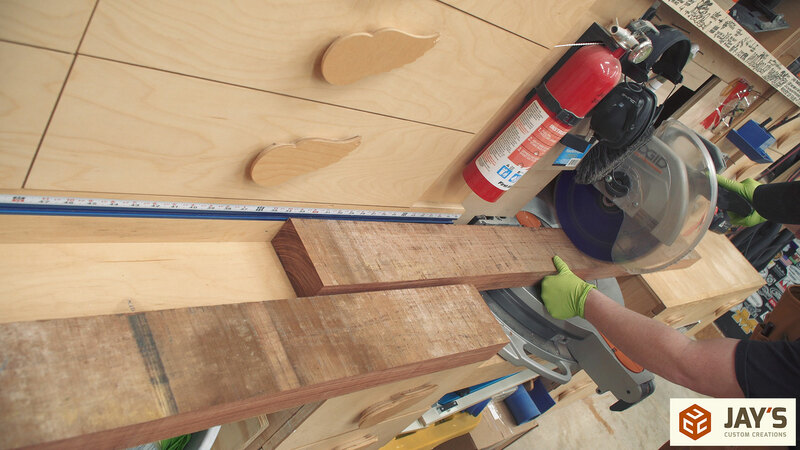 I also took two strips out of the maple board and had the intention of cutting them into four smaller strips to boarder the bubinga boards. You’ll see later that I ended up not adding these. 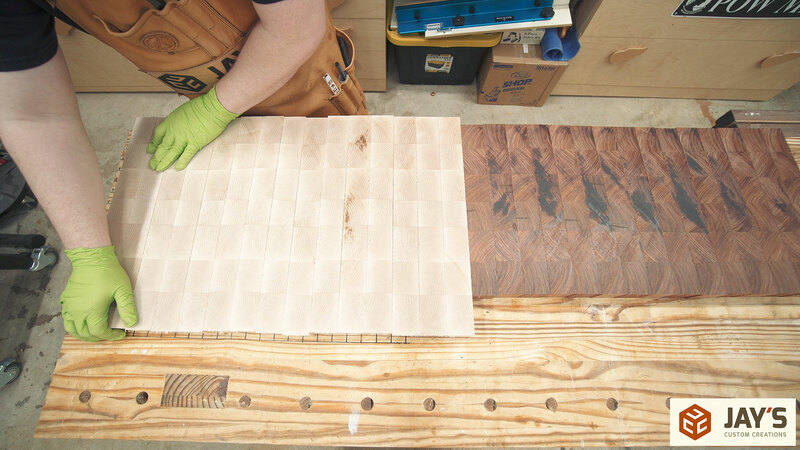 More repetition of gluing panels together but this time the pieces are rotated so that the end grain is facing up. About this time I also got tired of using a brush so I switched to a small roller…which is what I should have been using from the beginning. 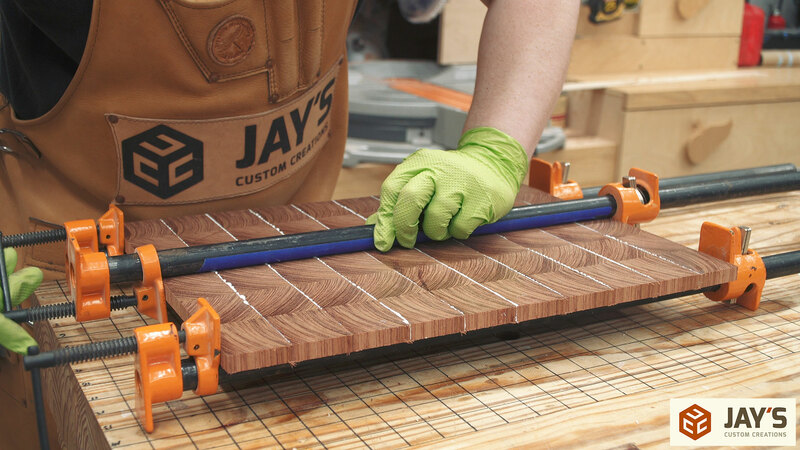 The thinner inlay material is glued up the same way. After letting those glue-ups sit overnight I started the next day by flattening the large maple panel off camera at the drum sander. 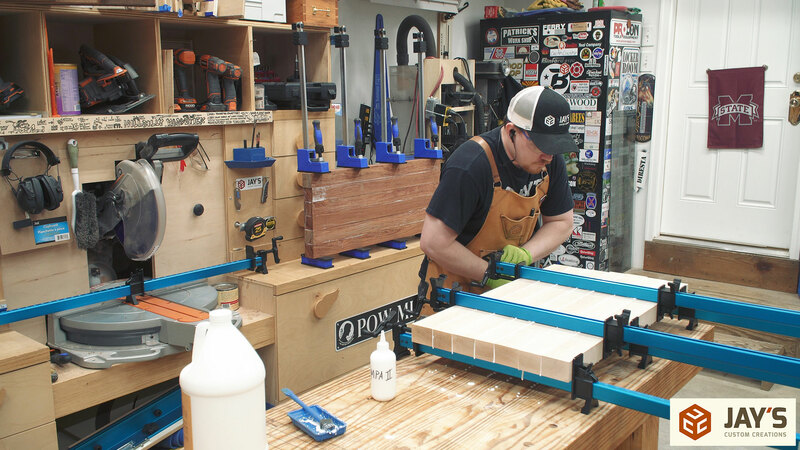 Just like the bubinga board, the maple board just seemed a little too large at this point so I cut it into two smaller boards. Finally on day four the inlay work can be started. Two bits will be used for this entire process. 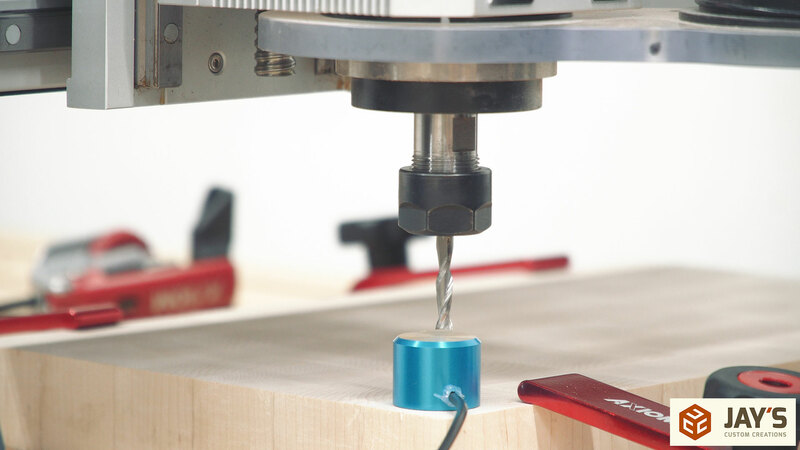 A 1/4” end mill to remove the bulk of the material and a 60 degree V bit to establish the shape of the inlay. 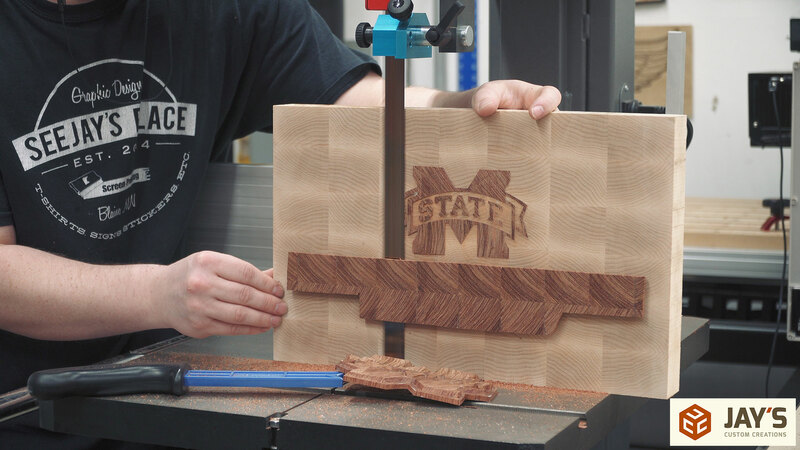 Making a V carved inlay allows you to have sharp interior corners unlike a straight wall inlay cut entirely with an end mill. 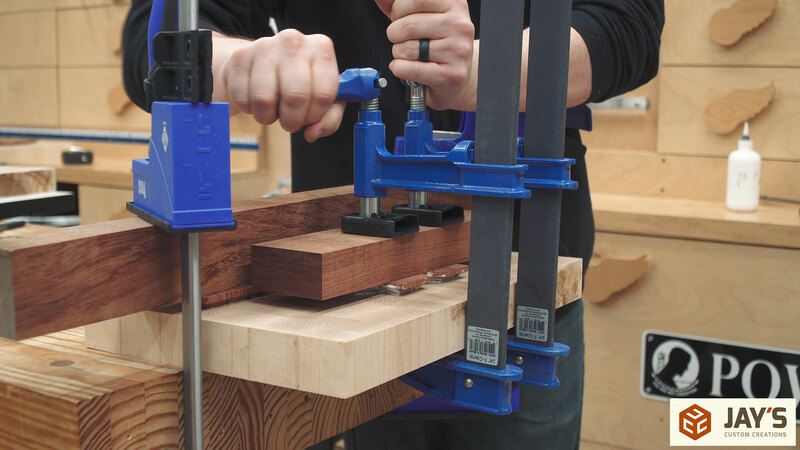 With the Z axis height set the bits can go to work cutting the inlay. First the bulk of the material is removed with the end mill. 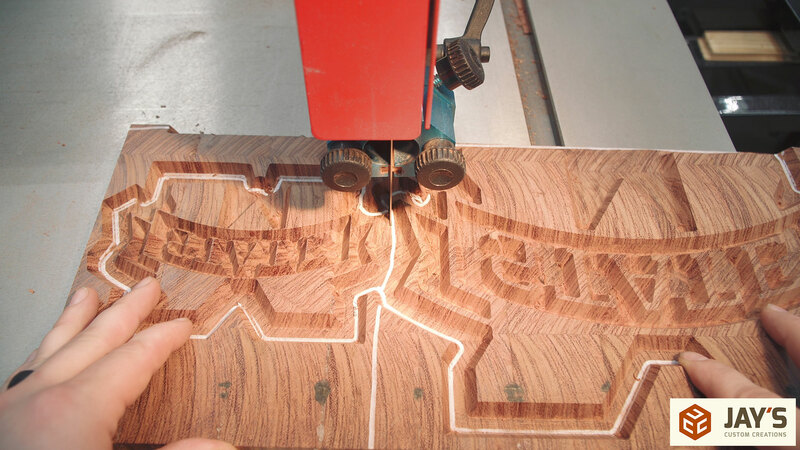 And then the actual shape of the inlay is established with the V bit. You’ll notice a lot of fuzzy pieces where the path of both bits intersect. I’ll address that shortly. 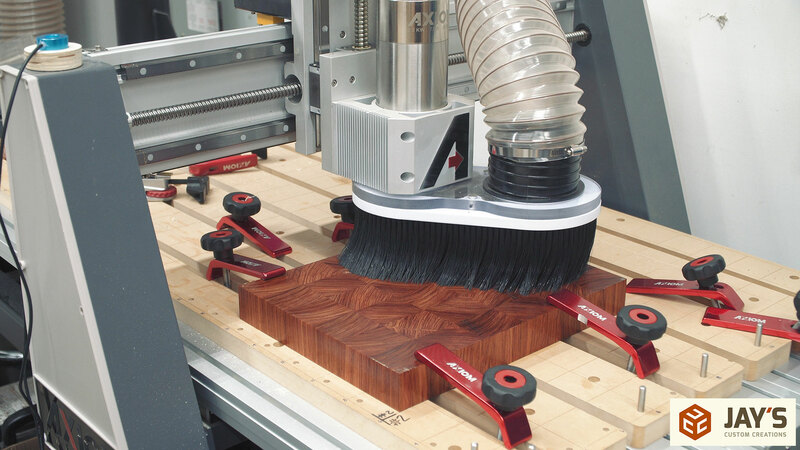 While the CNC was at work I was using the drum sander to clean up the bubinga boards. 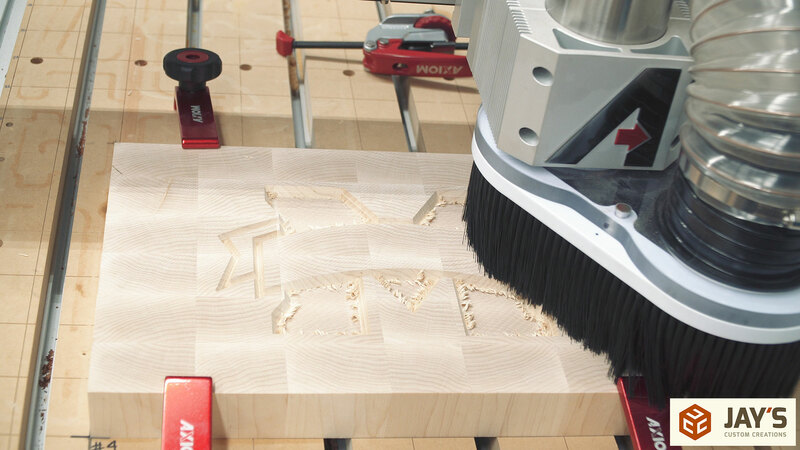 Letting the CNC do it’s thing while you do something else is like having a cheap hourly employee who is always ready to go and doesn’t show up late or drunk for work. 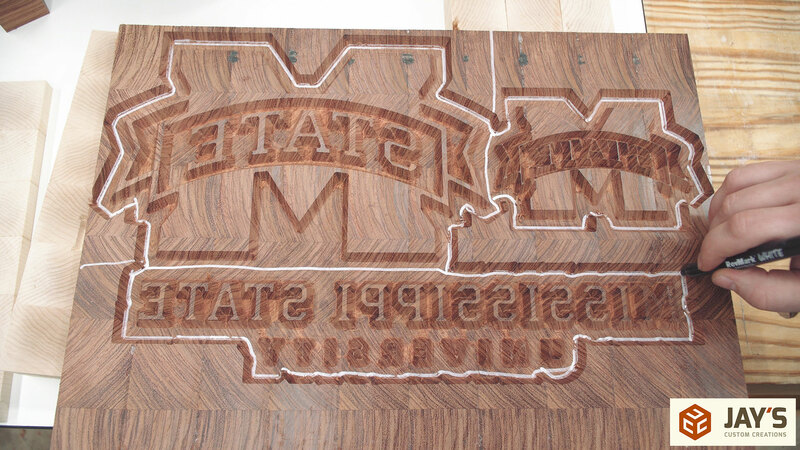 You can barely see the MSU design but this is the second maple board cut. 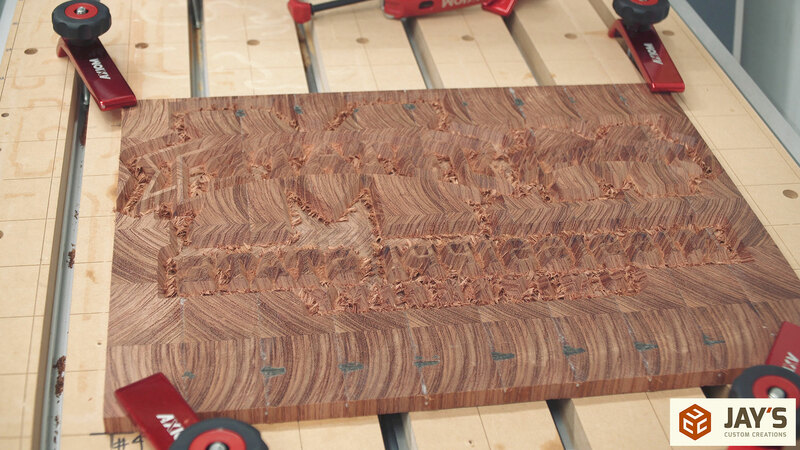 With the maple boards cut I turned my attention to the bubinga inlay panel. 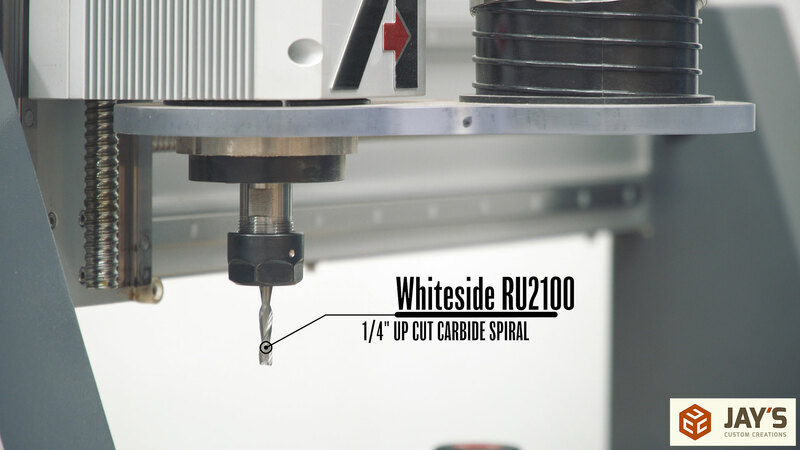 First with the end mill. And second with the V bit. The amount of fuzzy ends here really made me start to wonder what was going on. But it only took a minute or so to break off the fuzzies with a flat screwdriver. I’m really good at screwing up the simple things so I used a high visibilty marker to let me know exactly where I needed to cut at the bandsaw. 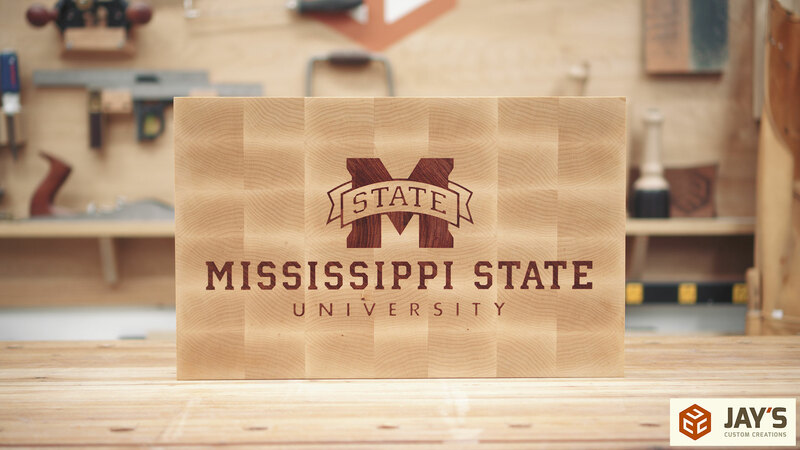 Lesson learned number three; let the CNC do more work when cutting the inlays. 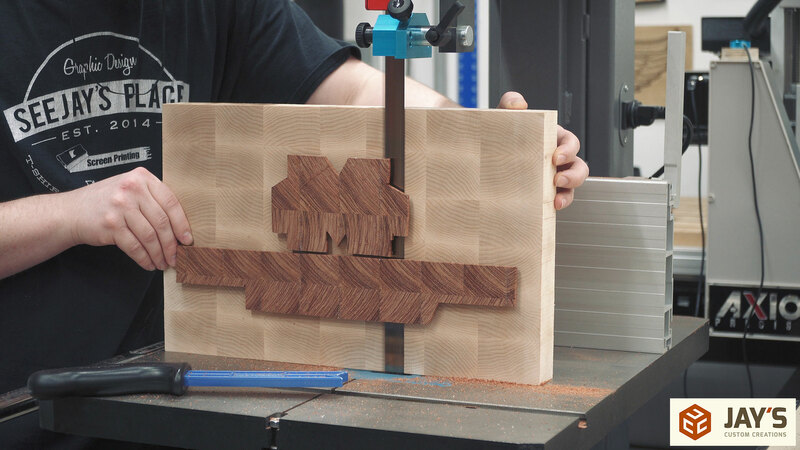 Rather than making a simple rectangle around the inlay vector and letting the CNC cut all the waste I thought it would save time by offsetting the vector shape and then cutting out what I needed with the bandsaw. Well, it would have saved time if I had a blade in the bandsaw that allowed for tight radius cutting but I did not. I have kept this Resaw King blade in the bandsaw since day one of setting it up so tight curves are out of the question. 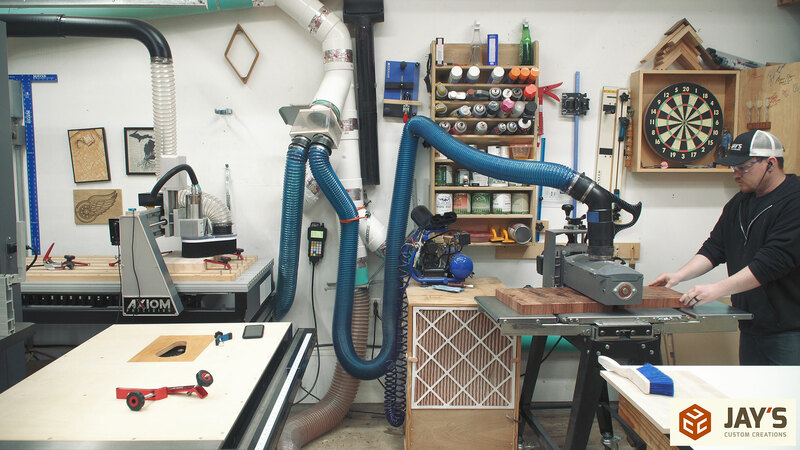 Lots of extra bandsaw work that would have been eliminated via a simple rectangle on the computer. Lesson learned. Now the first inlay material can be glued in. For some of the inlay it’s a true V carve so the V inlay will bottom out in the V pocket. 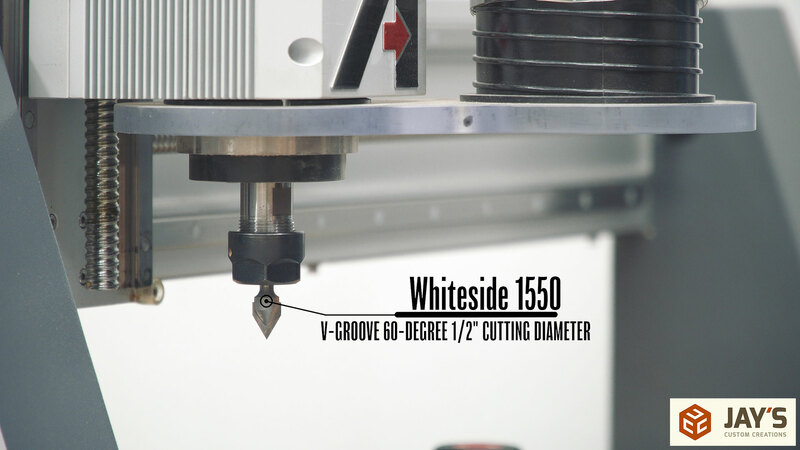 Every place that the ¼” end mill touched is where there is a flat bottom and a space for glue. This ended up being a problem and another lesson learned. I’ll get into that soon. 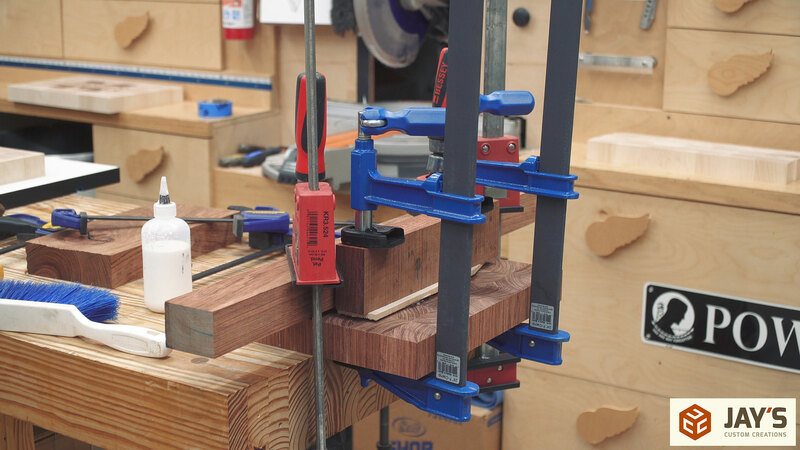 Lots of clamps and cauls to get even clamping pressure. I didn’t have enough long reach clamps to glue all four boards at once so I only glued the inlays in the maple boards first and let them sit overnight. 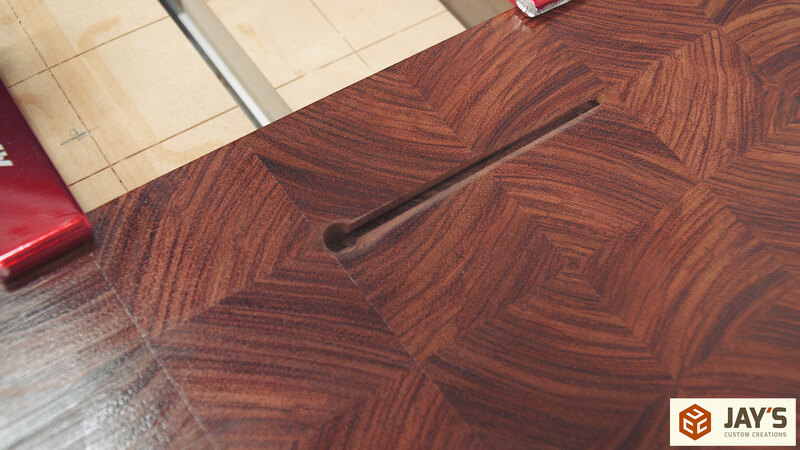 On day five of the project I started by cutting off the bulk of the inlay waste at the bandsaw. While this worked quite well it was a little more nerve-racking than I would have liked due to the amount of the blade being exposed while passing something tall and proportionately thin through the saw. But as always, if you take your time and are mindful to avoid the possible dangers then it should work out alright. 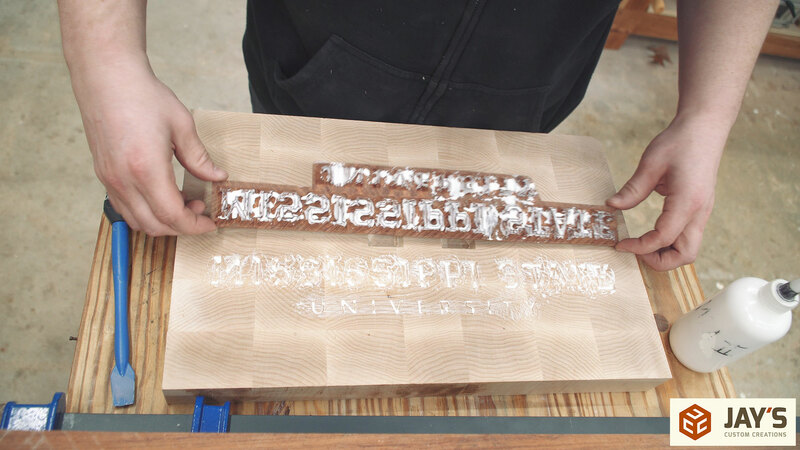 Next up is to start the cutting process on the maple inlay panel. 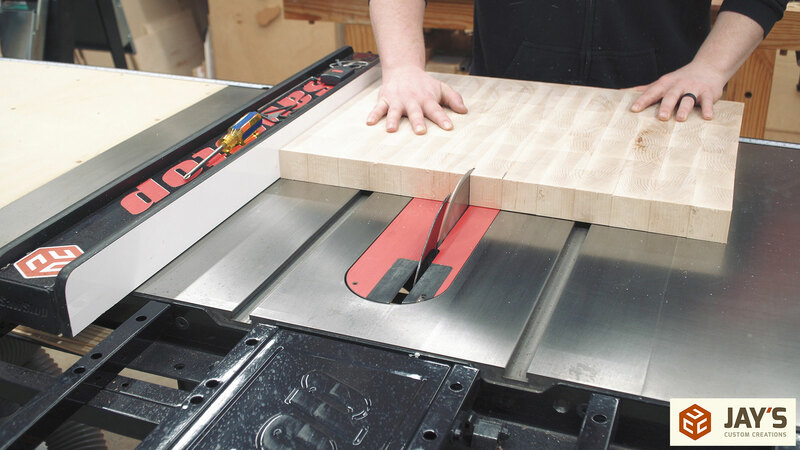 This image shows how much the panel bowed after cutting. As soon as I removed the clamps off the front side the panel bowed up. I was weary that this might cause issues when fitting the pieces but it ended up not being an issue at all. 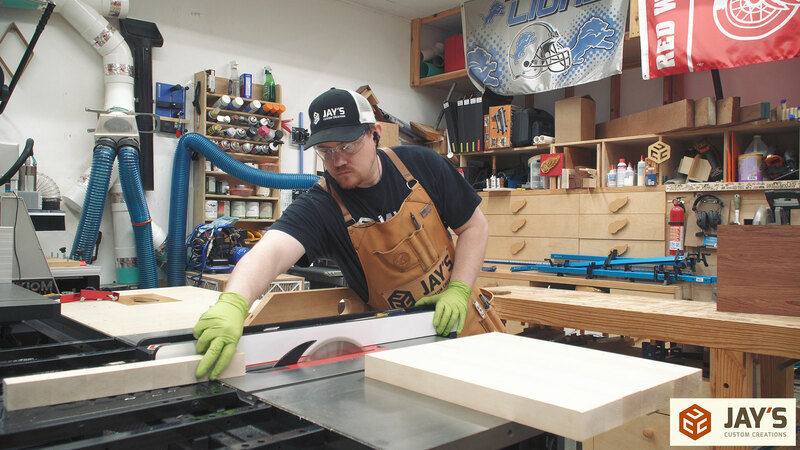 While keeping the CNC machine running I started the clean up process on the maple boards by running them through the drum sander. 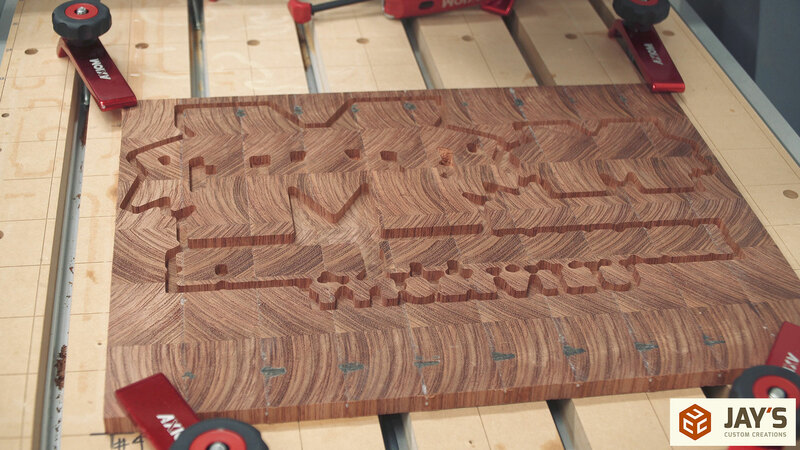 When the time came to cut the bubinga boards on the CNC I did some sequence testing with the two cutting bits. This first picture shows the results of running the V bit first and the end mill second. Notice how little clean up work is necessary at the bottom of the V carve. This second picture shows the result of running the end mill first and the v bit second. As you can see the results are now here near as clean where the two cuts intersect. 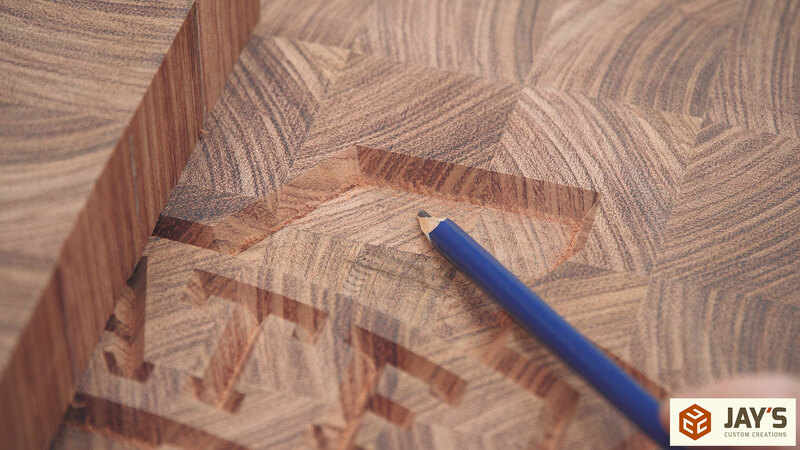 I noticed that this fuzzy intersection only happens when cutting end grain and not long grain. 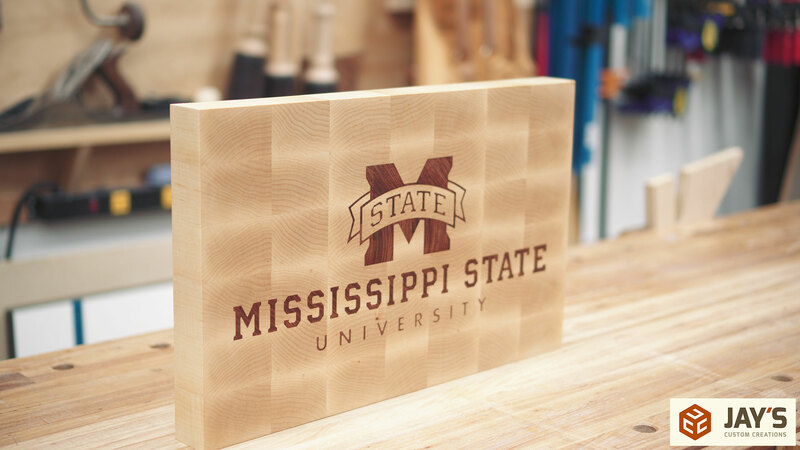 My thinking is that the grain in this orientation is like a bunch of straws standing on end. It’s easy to cut through the straws the higher you go because the bit is moving faster away from it’s center. 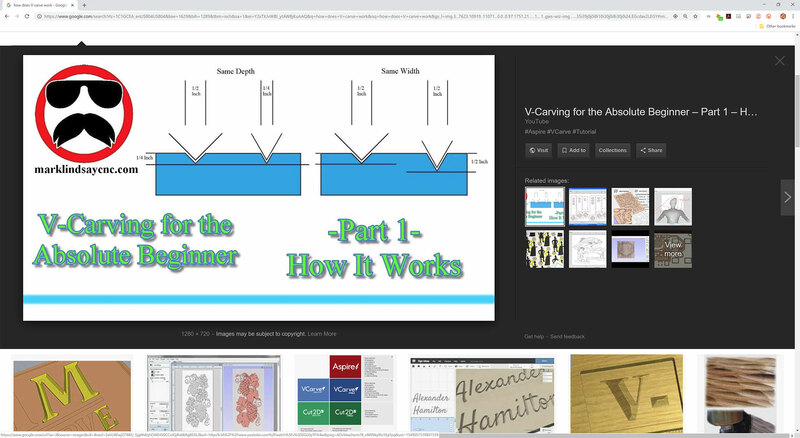 But because the V bit comes to a point the rotation speed and surface area covered at the point is much less than the widest area of the bit and therefore not as effective at cutting. So if you stand a stack of straws together and swing a sharp blade at them there shouldn’t be any issue cutting them. But if you try to cut the same stack of straws right at the base where they are fixed to something and go much slower you are more likely to bend and push the straws over than you are to cut them clean. That’s what I think is happening here. 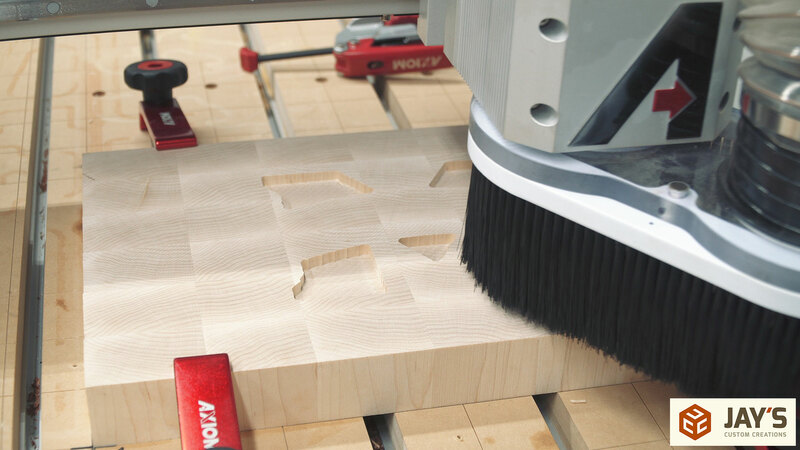 The end grain fibers are just being bent over because the empty space where the end mill cut first offers no resistance. 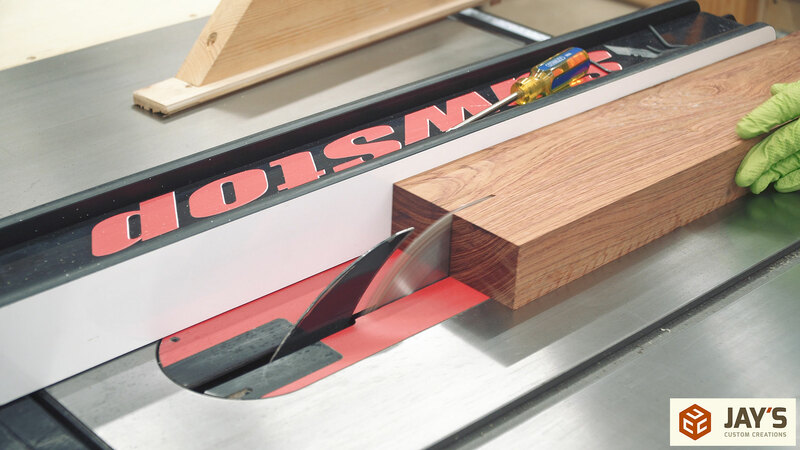 If the V bit cuts first there is no room to bend over the fibers and therefore they are just forcefully cut. 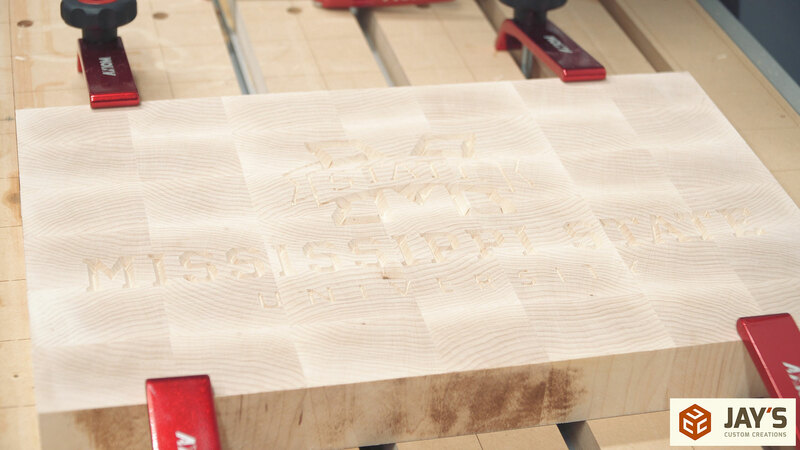 None of this happens on long grain cuts. And after the CNC work is done the final inlays can be glued in place. I let these sit overnight once again to start the final cleanup work on all the boards the next day. Day six was disappointing. It was the day I realized my inlay technique mistake. 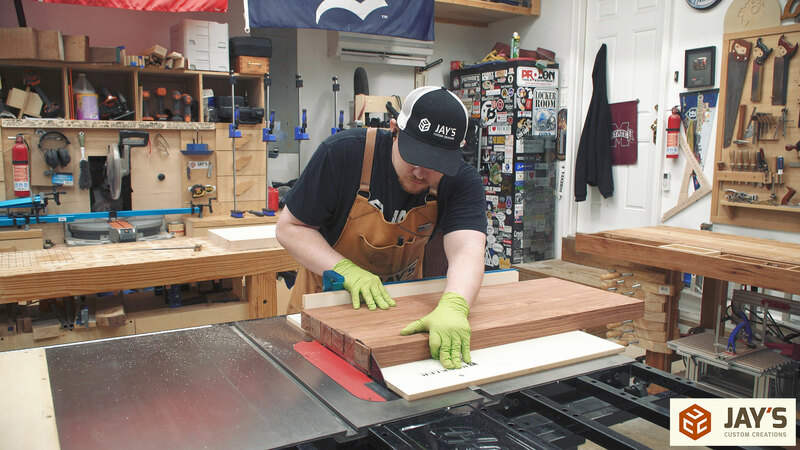 After getting all of the boards flush with the drum sander I noticed a very hollow sound coming from the larger inlay surfaces. I knew immediately what the problem was. 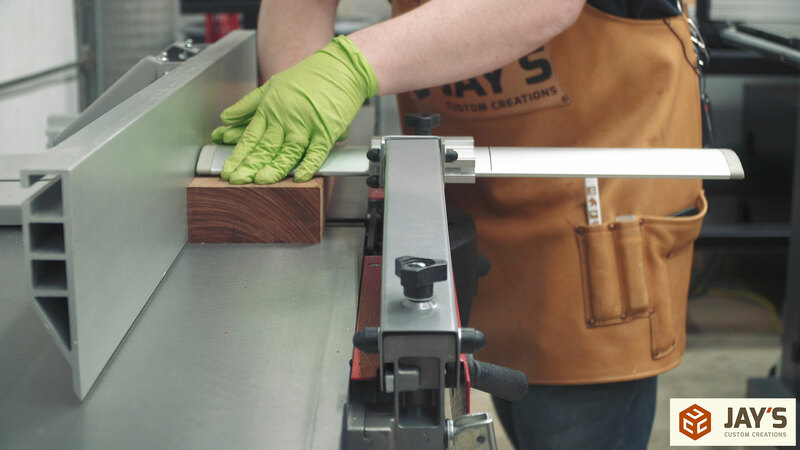 When tapping on every area where a flat bottom was cut in the inlay process the hollow sound was evident. 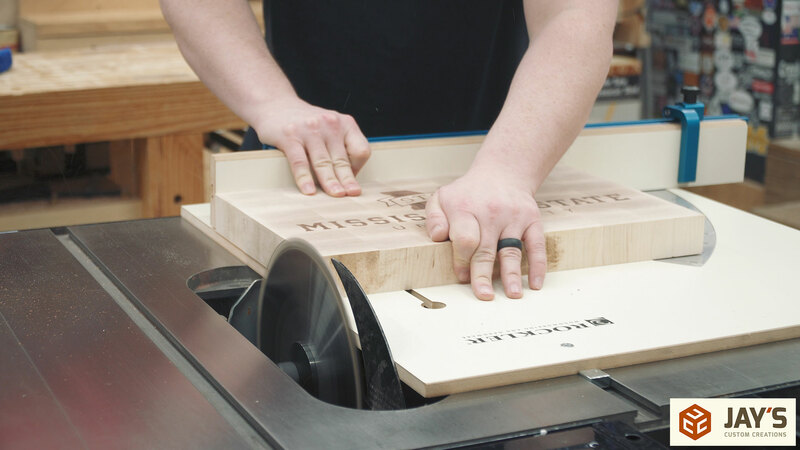 This means there is too much hollow area under the inlay and therefore the boards cannot be used as cutting boards. Instead, these instantly became over engineered wall art. At this point I was frustrated with myself. I was following a PDF inlay guide I found online and previously tested with good results. Here’s a picture of my test board a week prior to cutting these. I followed the exact same guide with the exact same toolpath settings so why did I get such a drastic difference on this project? And then it all made sense. 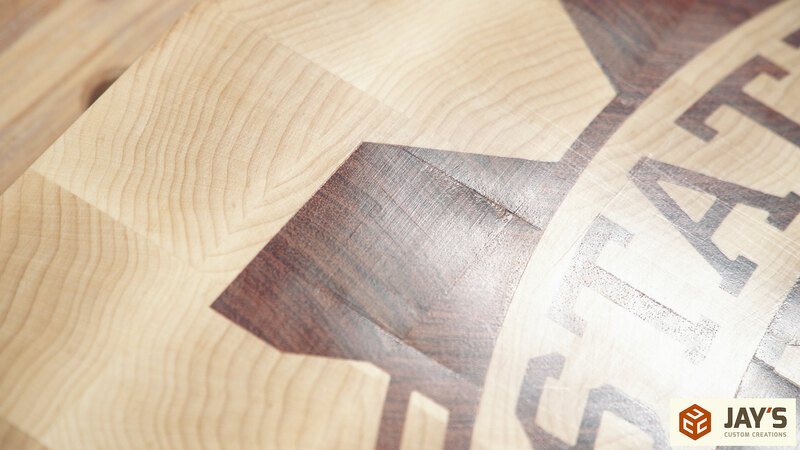 The specification for a flat depth on the inlay is where the problem lies. 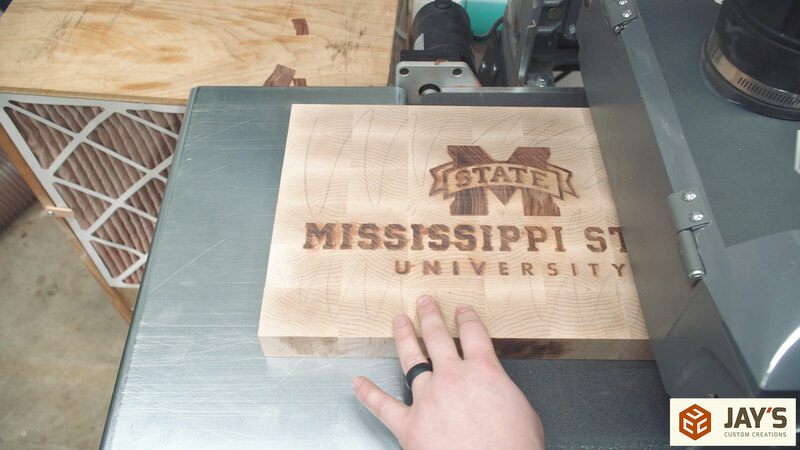 On my first attempt at this test piece I forgot to flip the inlay vector so it didn’t work at all. On my second attempt I had to reduce the overall size of the vector due to the scrap wood I was trying it on and in doing so I eliminated the end mill all together. This second attempt was entirely a true V carve with no flat areas. Being able to just identify the problem wasn’t enough. I wanted to see the exact gap that I had and the exact inlay thickness I had over the larger areas. 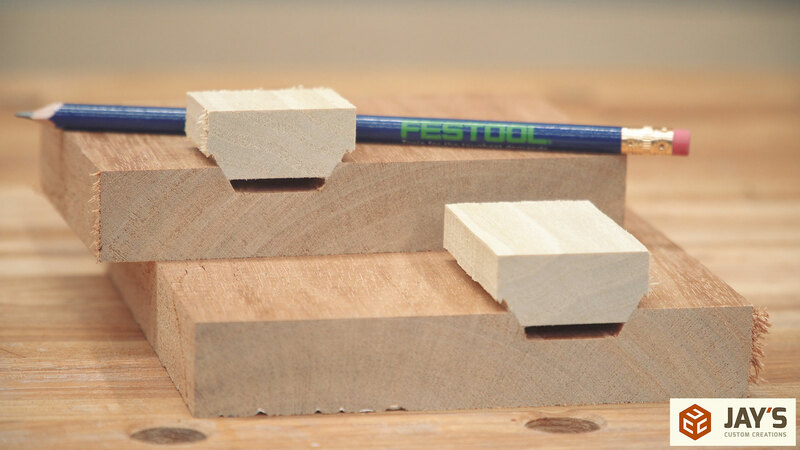 I went back to the computer, modeled a simple rectangle inlay with the exact toolpath settings I used, cut it out of contrasting scrap blocks, glued them together, waited till the next day, and cut it in half. This is the result. I included a pencil in the photo for scale but what you’re looking at is a .1” gap below the inlay for excess glue, .1” of actual inlay material, and .1” of waste material on top for a clamping surface. 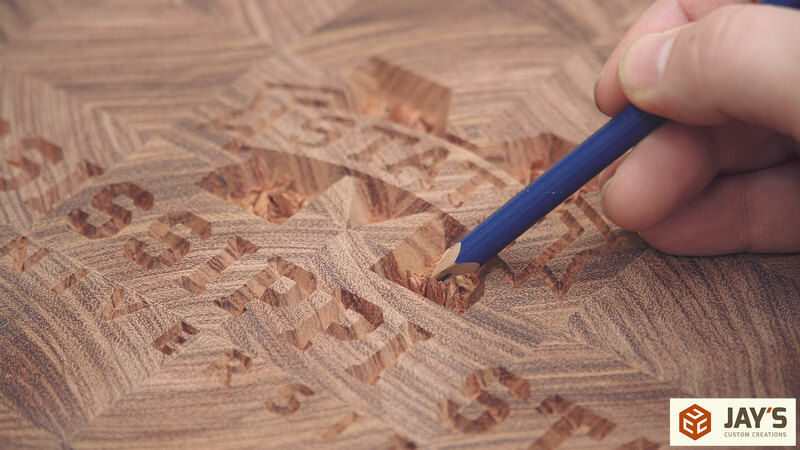 For a decorative inlay, the guide I followed is foolproof instruction to get great results. 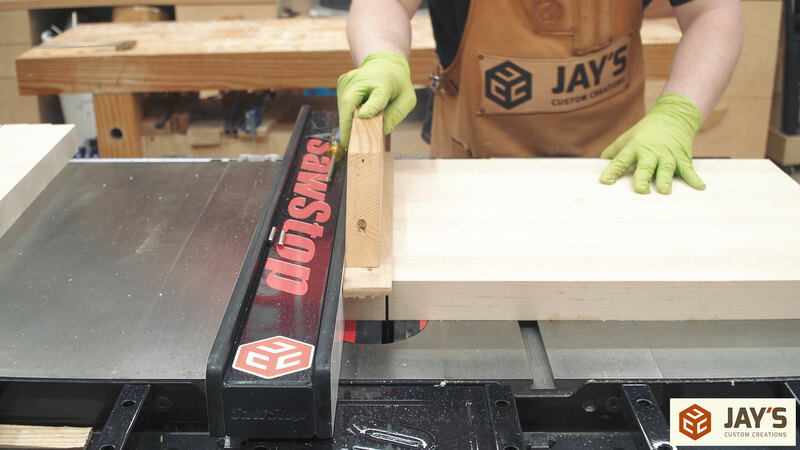 For an inlay that demands structural strength, such as a cutting board, the gap at the bottom for excess glue is just too large. 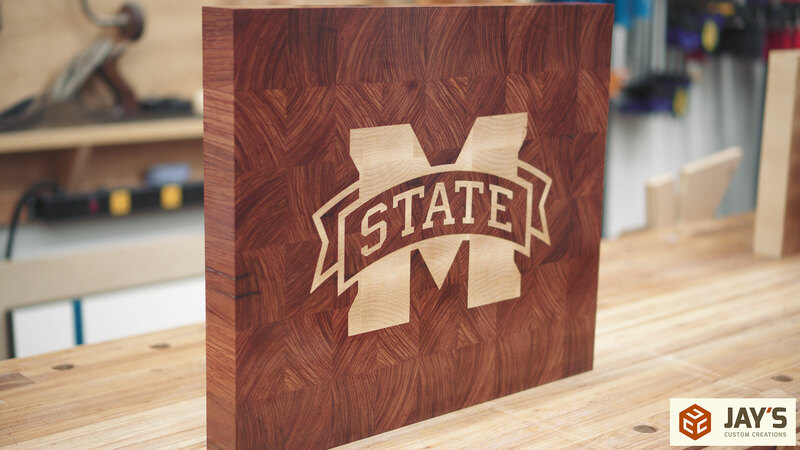 This was confirmed by talking with a few people on Instagram who make inlay end grain cutting boards successfully and don’t allow for any extra pocket below the inlay. That information combined with the fact that every shallow V carve cut on these inlays is a 100% fit and there are no problems with alignment due to glue not having a place to go tells me that lesson learned number four is to not add additional space for glue when making a V carve inlay on the CNC machine. By day seven of this project my productivity and interest level tanked. 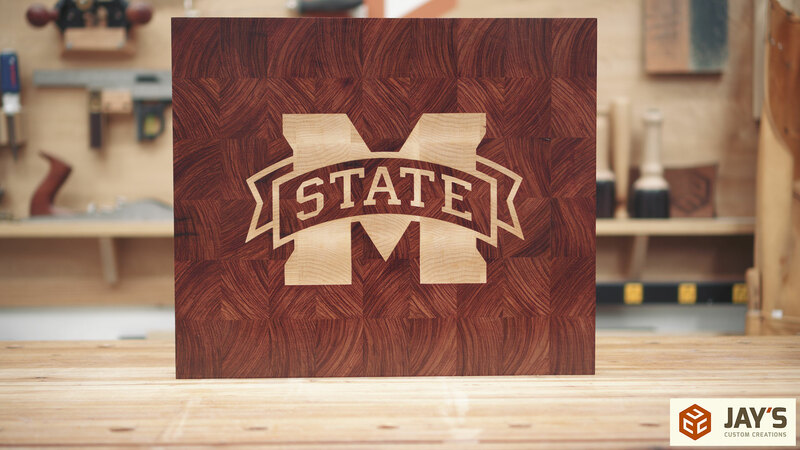 With these no longer being cutting boards like I initially intended I just wasn’t interested in the project anymore. I decided to not add the contrasting trim to the boarder of the bubinga boards and instead just get done with the project. From this point on the goal is to finish the pieces as wall art. 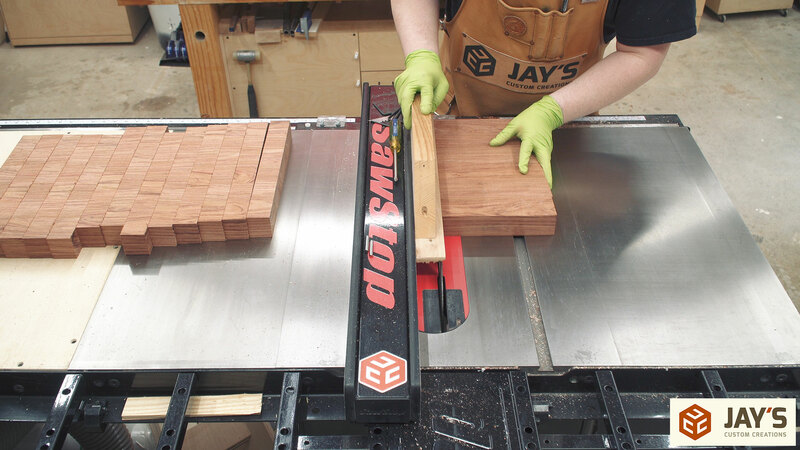 First up is to square all of the boards at the table saw with my crosscut sled. Followed by sanding up to 180 grit. 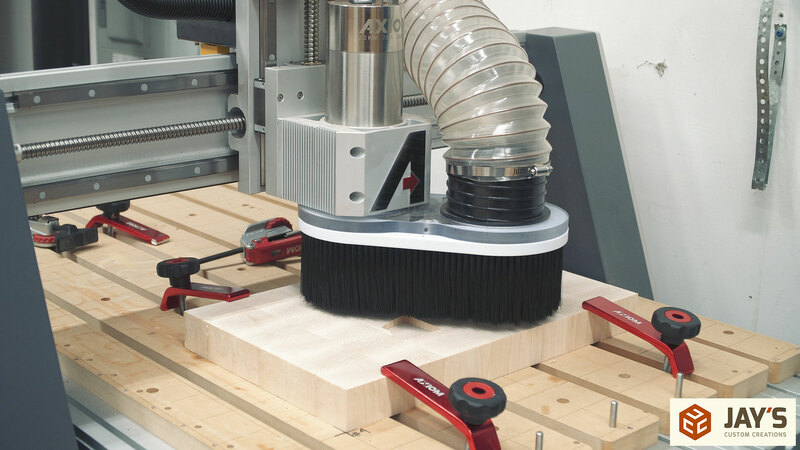 The drum sander is great for leveling surfaces and doing the rough sanding. 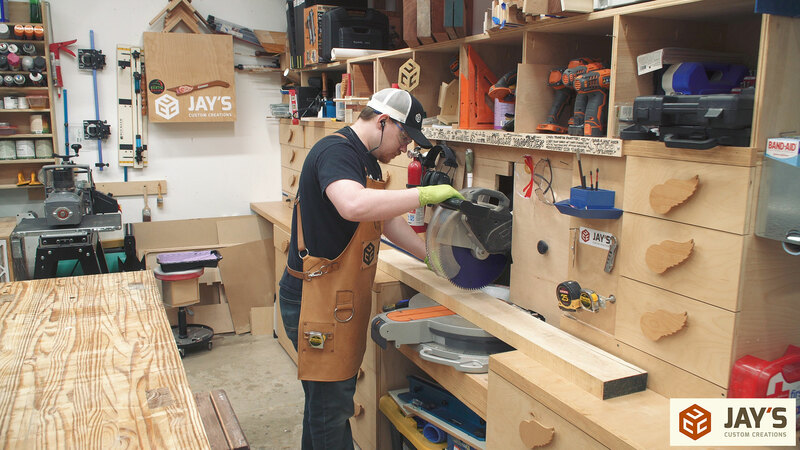 Some other type of sanding is still necessary to remove the scratch lines from the drum sander though. 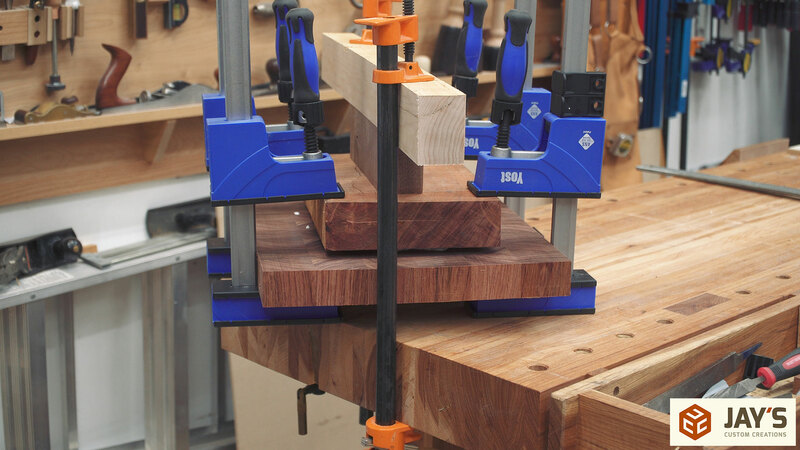 And for that I want to mention a couple of convenient gripy items that Rockler has for preventing material from moving while on the workbench. 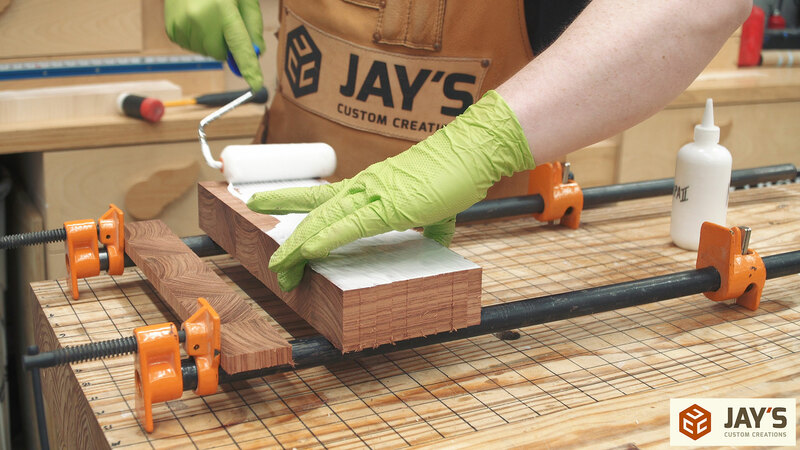 Not only are these blue silicone mats great for keeping glue off your work surface they are also great for holding the work piece while sanding. And an even better item for holding a work piece via gravity and friction is the Bench Cookies. Rockler is a partner of mine and when they sent these to me I honestly didn’t think I would use them much. My experience has been the exact opposite of that as I find these incredibly convenient for a lot of different tasks. Like in this example where I’m applying a finish I’m able to clean up any drips that may have gotten on the bottom surface without accidentally pushing the piece around like I commonly do with painters pyramids. 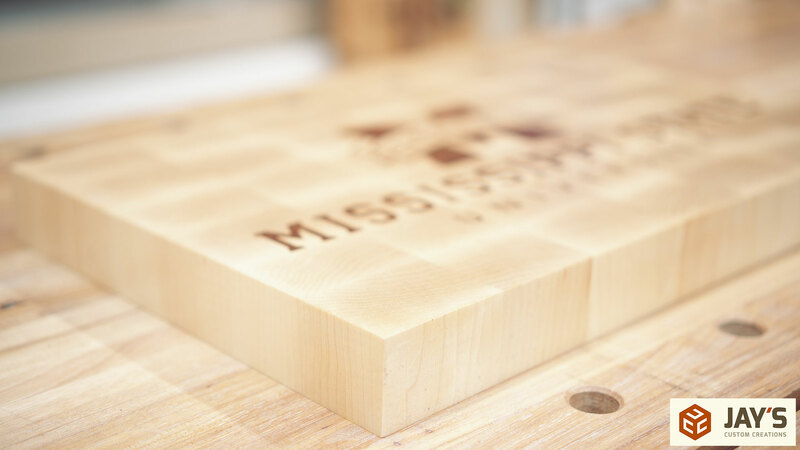 Because these are not cutting boards anymore my planned finish of mineral oil and bees-wax was replaced with shellac. I knew these end grain boards were going to be really thirsty so first up is a few flood coats on the visible surfaces. 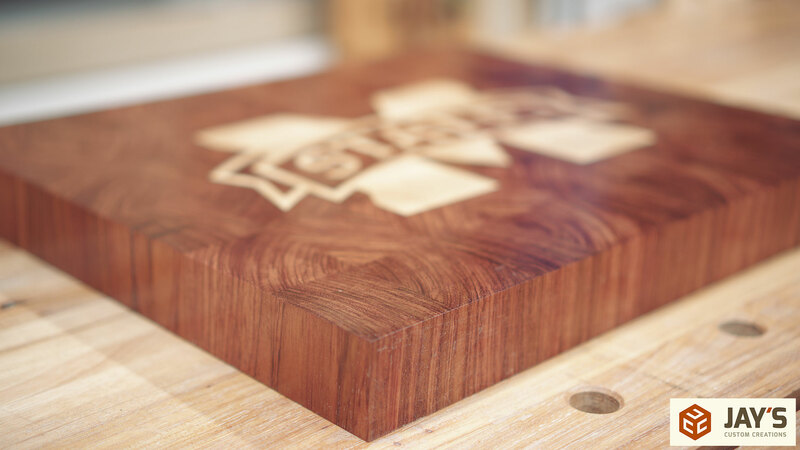 Lesson learned number five; always remember that wood movement due to moisture is faster and more noticeable with thinner wood than with thicker wood. This is something I already knew but was unpleasantly reminded of after a couple of hours of letting the flood coats of shellac cure. You can see here how the thinner center section of the inlay swelled up making the glue seam areas stick out like a sore thumb. This had to be sanded back to an acceptable amount until I eventually stopped in fear of cutting through the inlay. 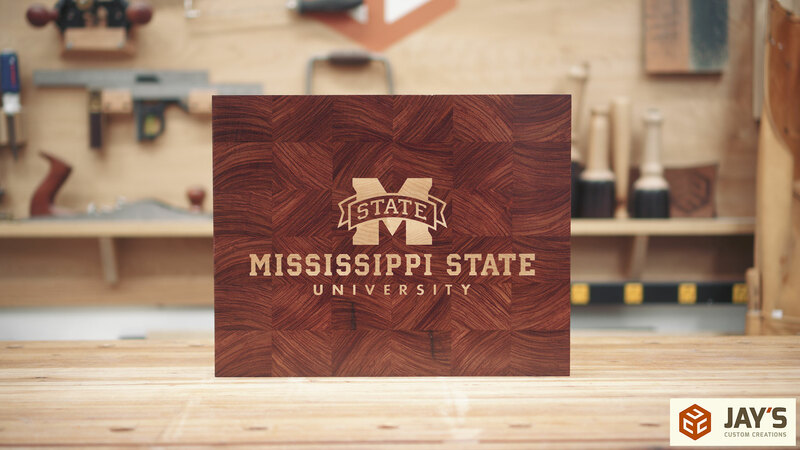 These are going to hang from the wall and the easiest way to accomplish this is with a keyhole slot cut in the back. 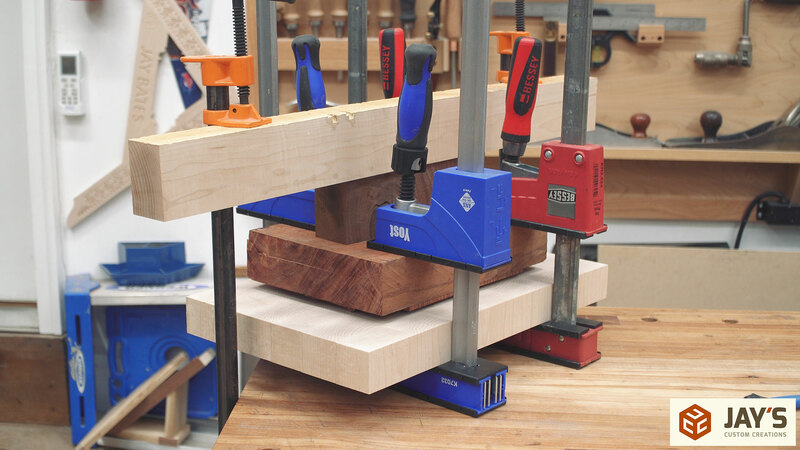 Because these need to be clamped to the machine surface with the good side facing down I figured it would be best to get this step done before completing the finishing stages. 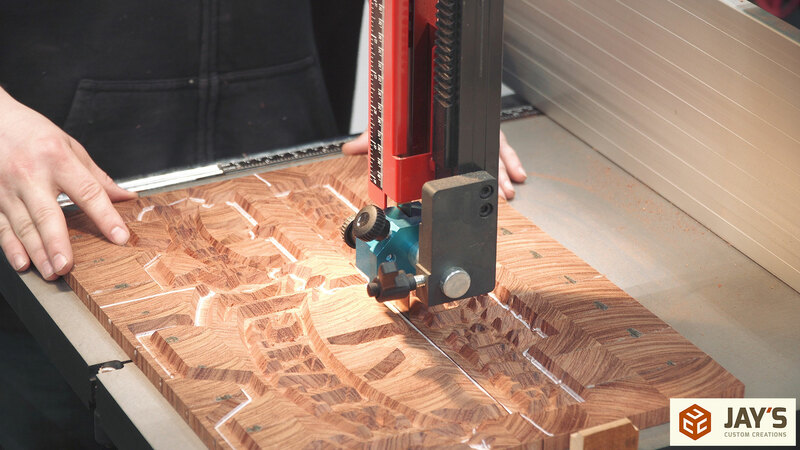 Just a quick back and forth pass with a keyhole bit in the CNC machine. Finally the rest of the shellac can be sanded with 320 grit sand paper to level the flood coats. 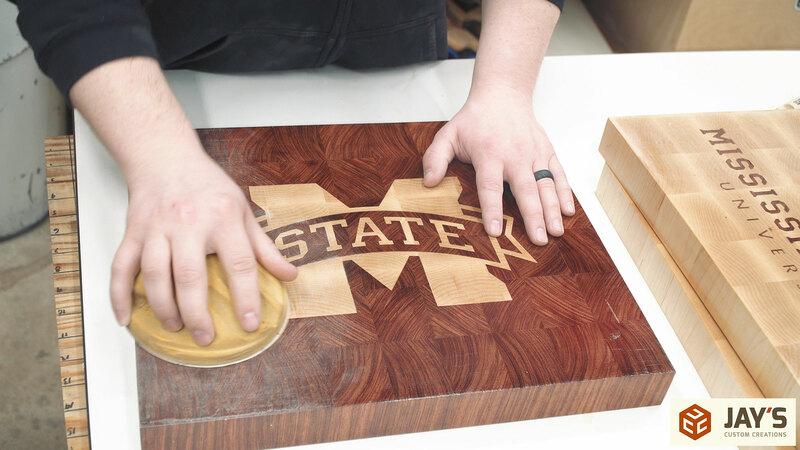 If the shellac is balling up on the sandpaper then the shellac needs more time to cure. 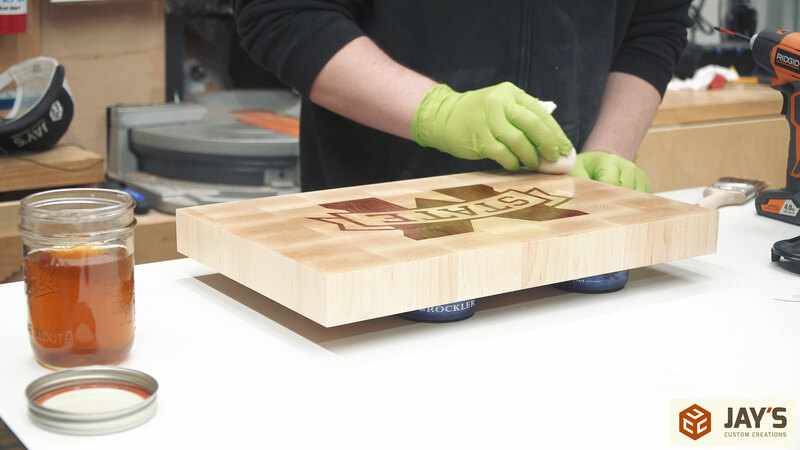 If the shellac is producing a fine dust and the sandpaper remains clear then you’re good to go. 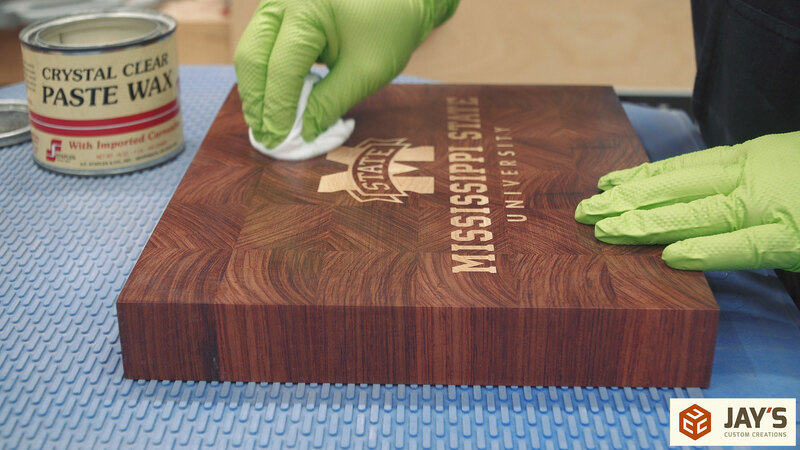 After removing all of the dust off the surface a handful of thin coats of shellac can be applied with a balled up rag. These thin coats dry incredibly fast so by the time I rotated through all of the boards the first one was ready for another coat. I think I added around 5 more coats this way. After letting the boards sit overnight once again, I began day eight with the final finishing steps. Multiple layers of shellac always produces a finish a bit too shiny for my liking. I evenly scuffed up the surface of each board with fine steel wool to get rid of the high gloss shine and then applied a layer of paste wax and quickly wiped off as much as I could for an even semi gloss finish. If you let a thicker layer of paste wax harden and then buff it out you will get a shiny surface again. And here’s the final result after lots of fun in the shop, lots of frustration, and lots of lessons learned. Ultimately the lessons learned are the most important and rewarding takeaways from this project. Every time I talk about mistakes there are a lot of people who say I’m just being too hard on myself. Which I understand their perspective to a certain degree. But it’s not about beating myself up mentally. I don’t do that. It’s about acknowledging the areas for improvement and using that information to get better. So I’ll end this with the two perspectives that I personally have on this build. One side of me is relating to the guy who batted his personal best with a couple RBI’s and a home run. That’s the part of me that thinks the end result of these is great! The other side of me is that same guy who missed a ground ball and let the winning run come through in the bottom of the 9th and lost the game. 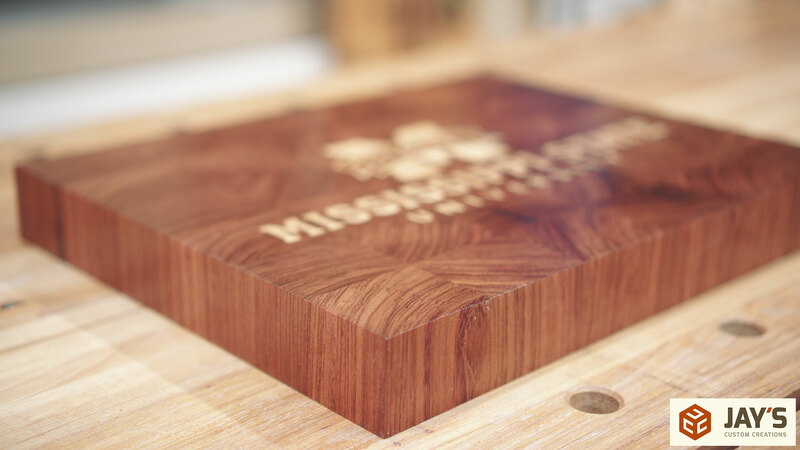 That’s the part of me that was wanting to give away a few really nice cutting boards. I don’t think either one of those perspectives is wrong. Anyway, lessons learned and now I am more informed for the next time. Hi Jay, great video. I left a comment on the YouTube video. 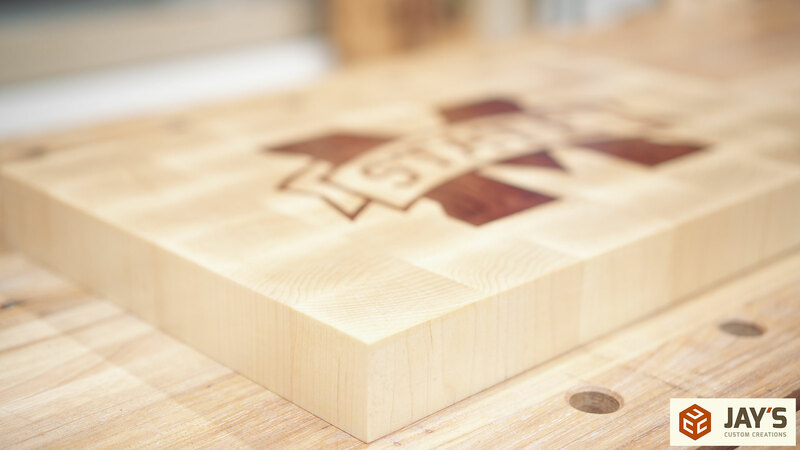 I have been making cutting boards for many years and I have been inlaying boards for a few years now. 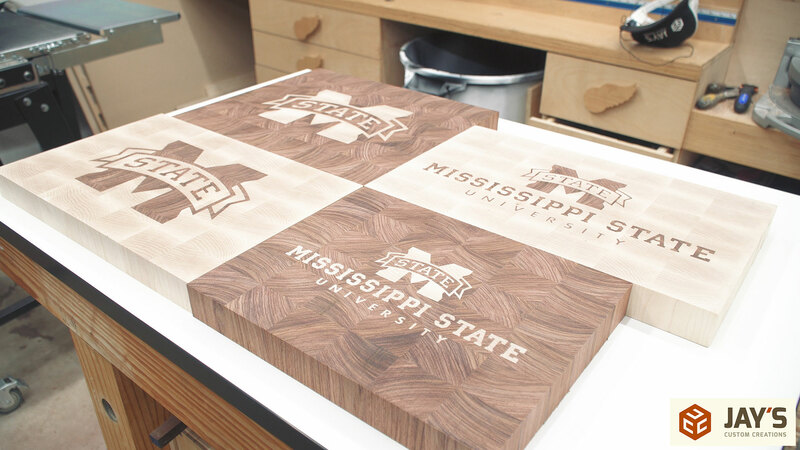 It is a shame you decided not to use the boards for cutting boards! ALL my customers say they will only display the inlayed side and ONLY cut on the back side so the inlayed side is always perfect! 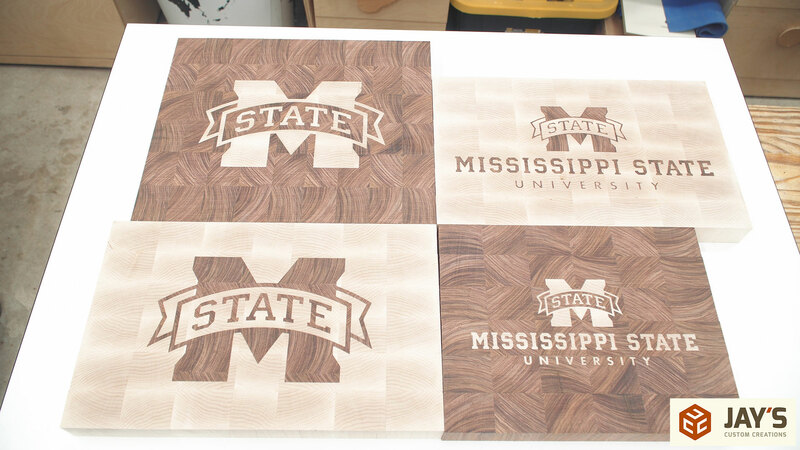 Other than the tonal issue they still can be used as cutting boards! 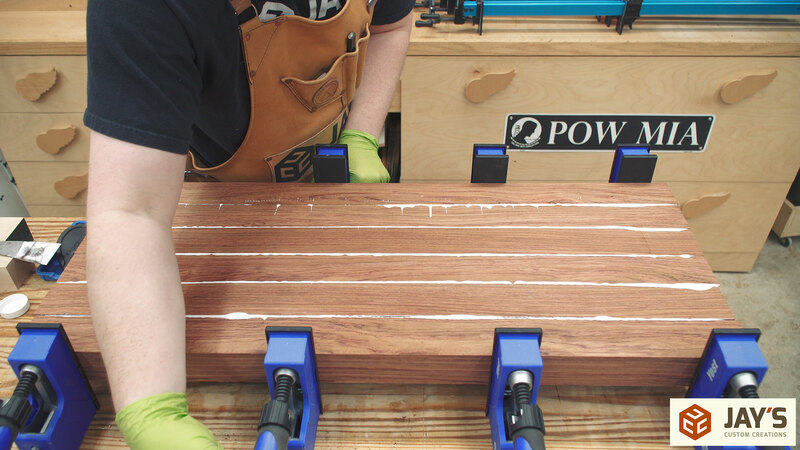 I would suggest to you (not sure if you do but the glue container said white glue I believe) the only glue on the market that has been approve for food based woodworking is Titebond III. Again thanks for the video and beautiful boards! 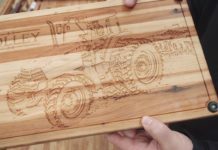 Great video, Jay, and really beautiful wall hangings and/or cutting boards. I always enjoy your “lessons learned” and how to remedy the situations. Keep ’em comin’; your videos are really great and fun to watch. Thanks for all the lessons. Very well documented and kudos on passing on your lessons learned to others. That is truly a nice thing to do! Great result at the end of the day(s). Great Video Jay. 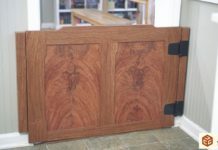 I am 62 years old and have made a lot of mistakes woodworking but I find that they have taught me a lot over the years. Keep up the good work. The video is great and the boards are also. 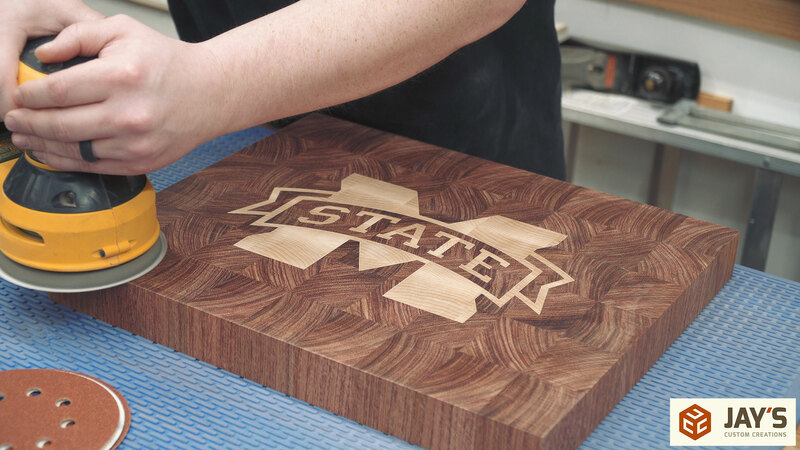 I don’t understand your opinion as to why a bit of hollow under some of the inlay prevents them from being used as cutting boards? That being said, Stephen B comments also make sense and would eliminate any doubt if used as per his writing. Wow I remember when you were more worried about function over form. 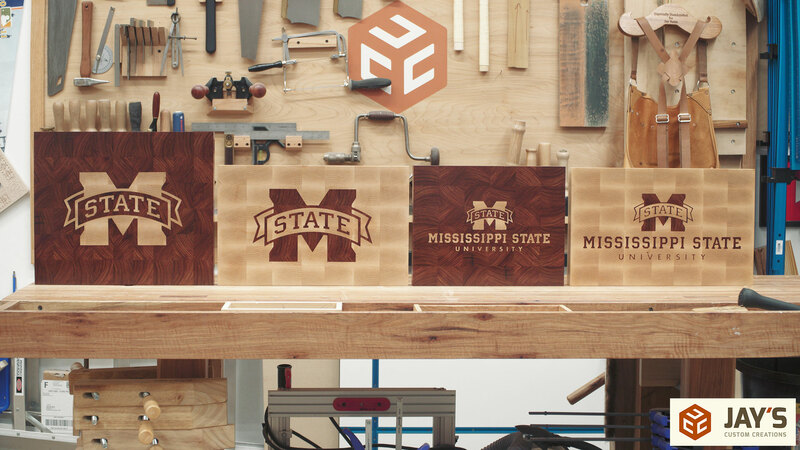 You have come a long way from 2 x 4 yard furniture. That’s a game winning grand slam to me. 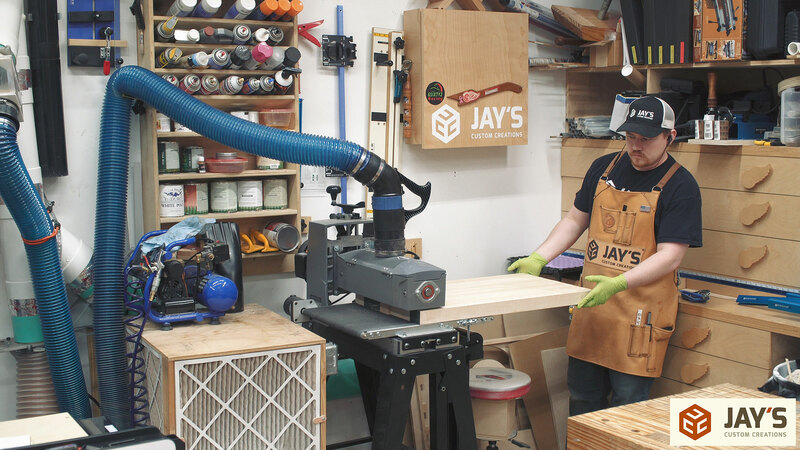 Jay, I have been following you for years, and I remember when you got your dust collection system, you made a big point that you dealt with the seller as another regular customer, not a famous web woodworker, and I remember that you were strict about not letting manufacturers give you things and influence your reviews. If so, I haven’t seen it anywhere. I don’t read everything you post, though, only what interests me, so I may have missed your disclosure that you are commercialized now. Are you getting payments from the products you promote? Hmmm…I think you might be mistaken. I’ve always been transparent with my audience about how items are acquired. I don’t recall making a big point that I dealt with the seller as another regular customer. Can you provide a link to freshen my memory on that one? I don’t recall ever being strict about not letting manufacturers “give” me stuff. Nothing is “given” and nothing is free. Again, I’ve always discussed these situations. 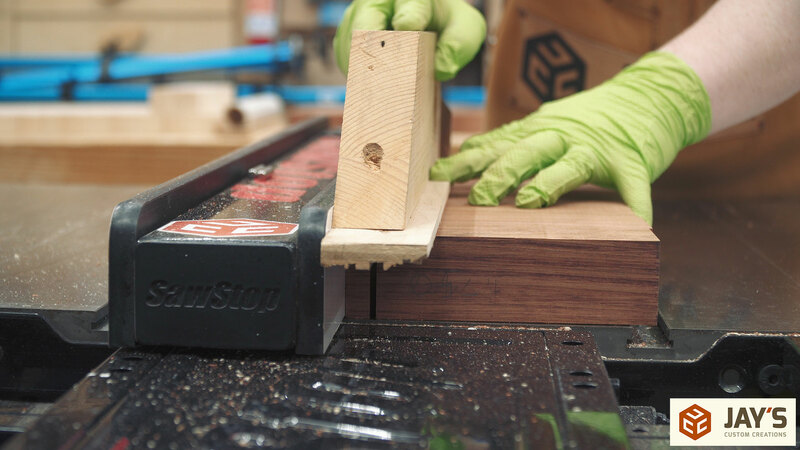 Like in my SawStop tool talk video for example. Anytime a video or article is supported by a company it is noted in the video or article. Aside from the fact that I voluntarily maintain transparency with my audience, why is it a requirement to disclose business agreements? I suppose you ask the creators of your favorite movies about their relationship with any automobile manufactures or beverage companies who’s logos appear in their videos as well, correct? Jay, I have always admired you for your honesty. 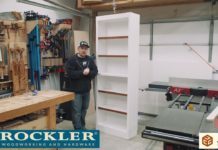 You have always said when tools or accessories were “given” to you and have always expressed your likes and dislikes about tools and accessories and explained your reasons why. Thanks for your honest opinions and keep up the good work. Beautiful Work. Way over my head but I enjoyed watching you in action. Very Nice. Beautiful work, Jay. Lessons learned are definitely appreciated, especially since i have a little Next Wave Piranha arriving in a day or two. Thanks Jay, very informative as usual. 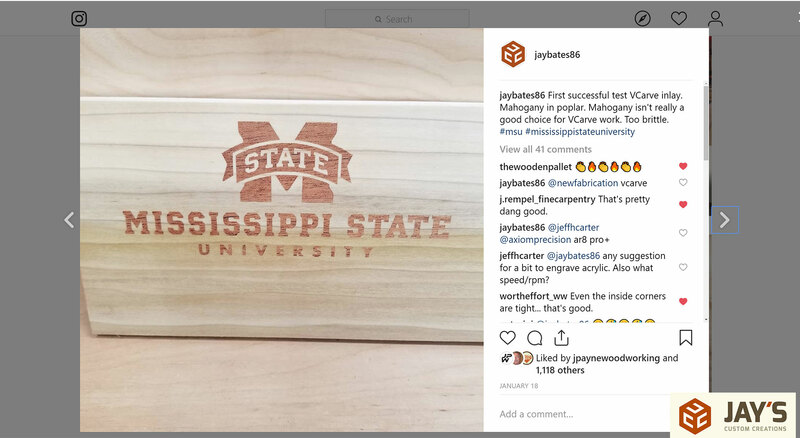 Hey Jay, if it were me, I would have recommended to the recipients to use the back side for cutting and the decorative side for display. 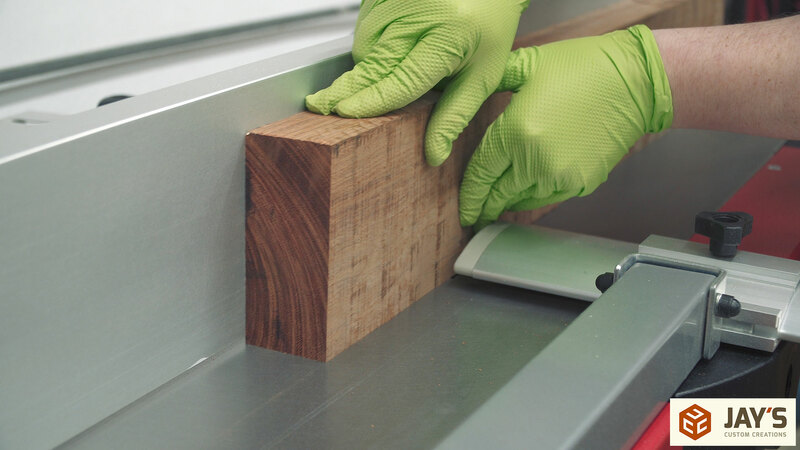 That would enable a pristine side for the artwork and the cutting side the way they always look after repeated use. Beautiful work nonetheless, and as always first rate instruction. Awesome video Jay! I learned alot from your mistakes lots of great learning points. 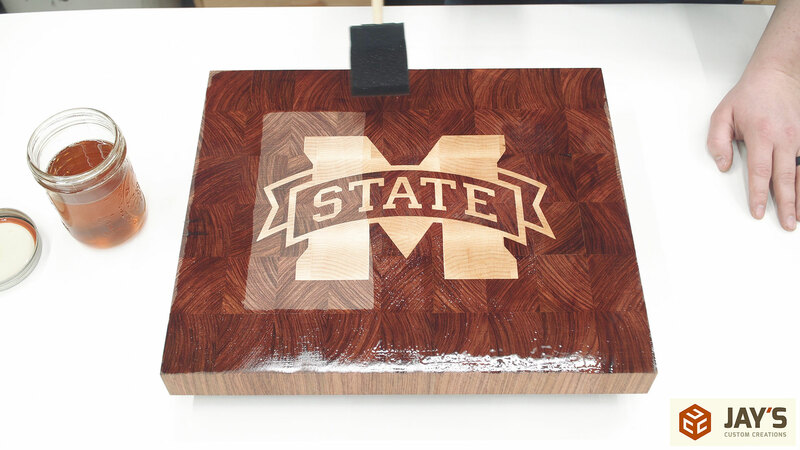 If you haven’t already seen him there is a guy that does the end grain cutting boards and does amazing work MTM wood. 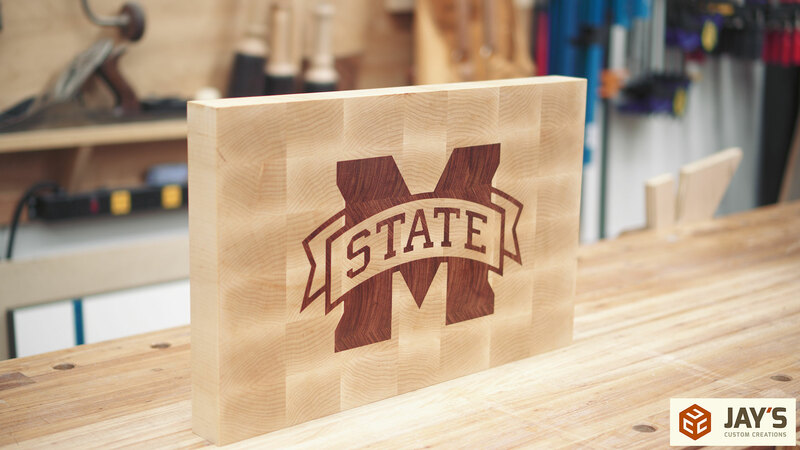 Someday when I finally get my shop finished and get a CNC machine I would like to make cutting boards like these. Once again great work I enjoy watching and learning from your videos. I understand to hollow sound. What i don’t understand is what you would change to compensate for that. 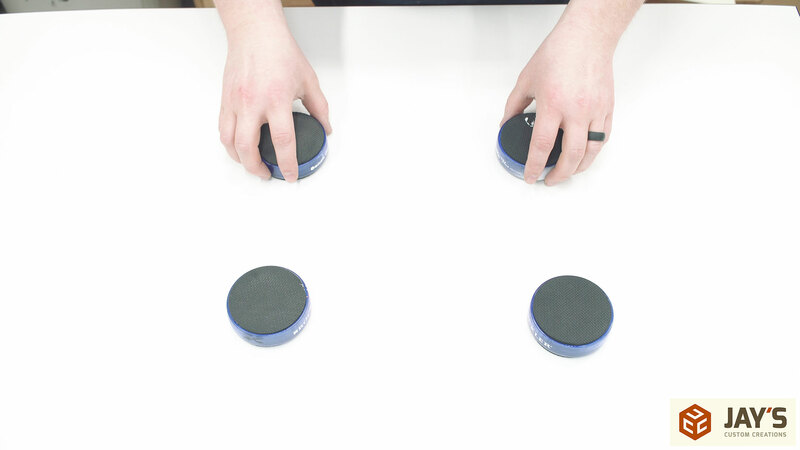 Can you go into greater detail on setting up the mirror image not to create the gap. Love the channel, blog and awesome work. Just wasted on a lousy logo. 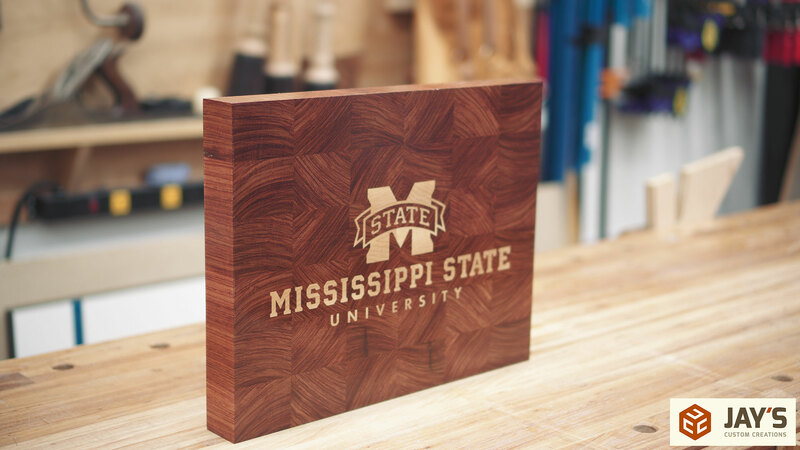 Jay I ran across your website when looking for plans to build a boot jack and was blown away by the MSU inlay cutting boards. 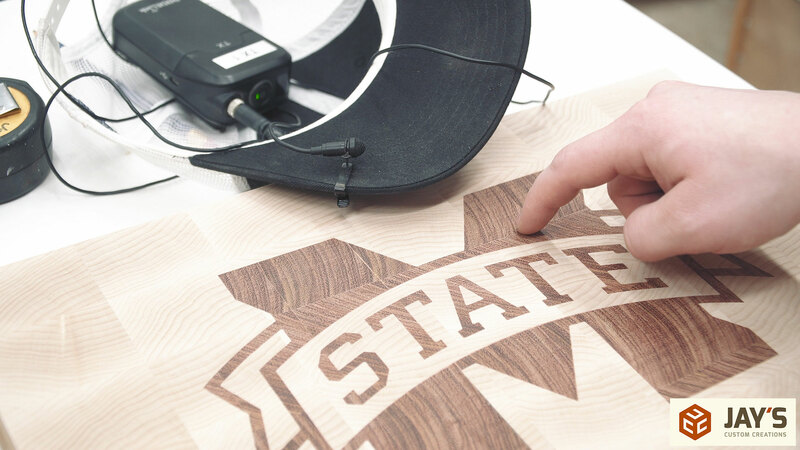 I was born in Starkville in 1945, graduated from State in 1967 and am a lifelong Bulldog fan. 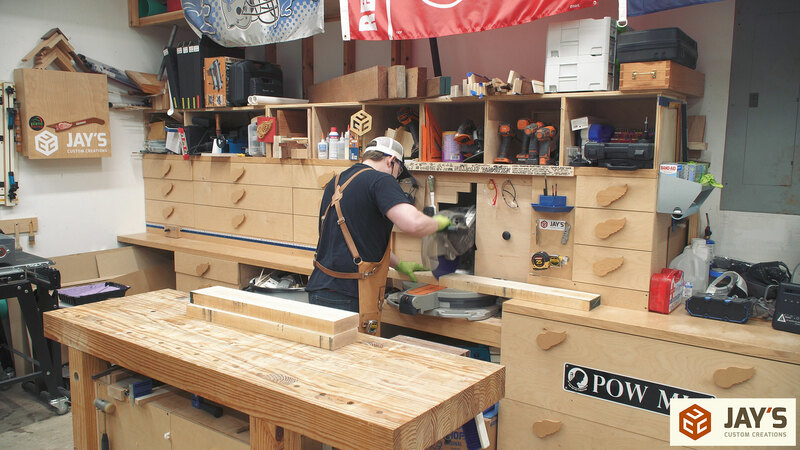 Glad I found your site and will check in frequently for good woodworking tips. Thanks. 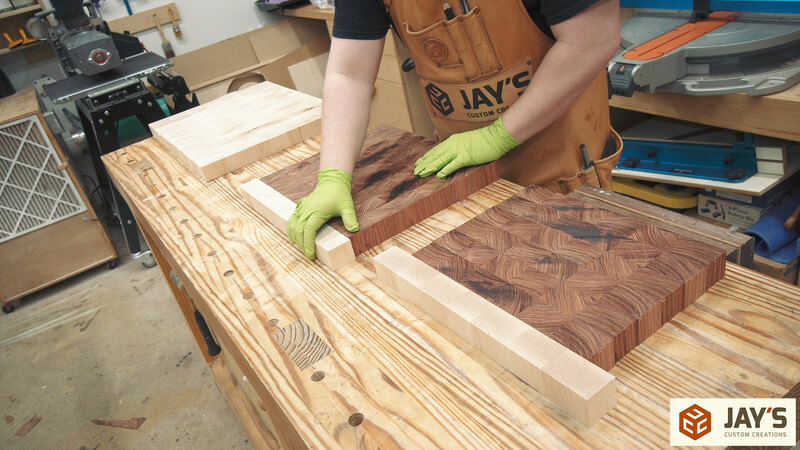 Great work on the cutting boards, Jay! I love the idea of hanging the boards on that wall with a key hole.